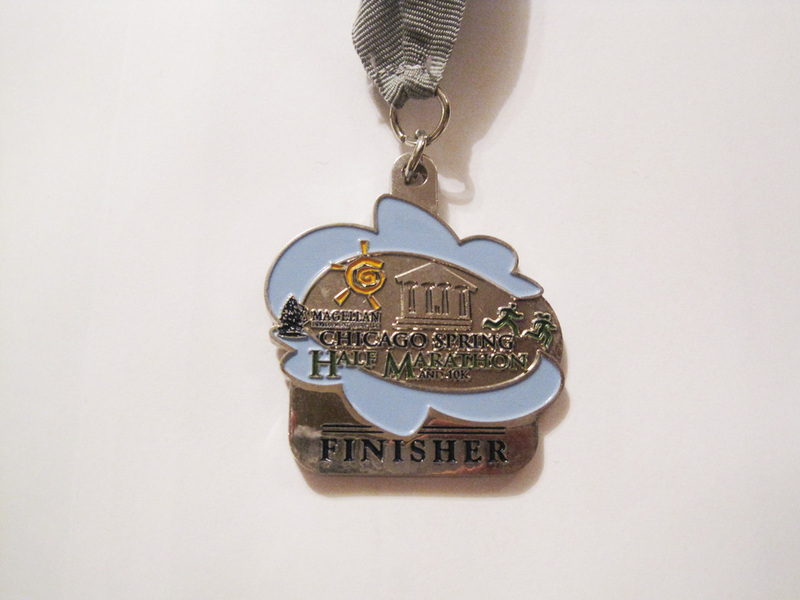 2012 Mercedes-Benz Half Marathon – This medal, like the Flying Pig, changes little year-to-year and for good reason: it’s a huge draw for its participants. The iconic logo is an instant eye catcher and it’s a very classy prize for any participant. My only gripe is that it’s the same across all three races (full, half and relay), the only changes being the ribbon and the distance written on the backside. 2010 Damascus Bakeries Tucson Half Marathon – This is one of my favorite medals. 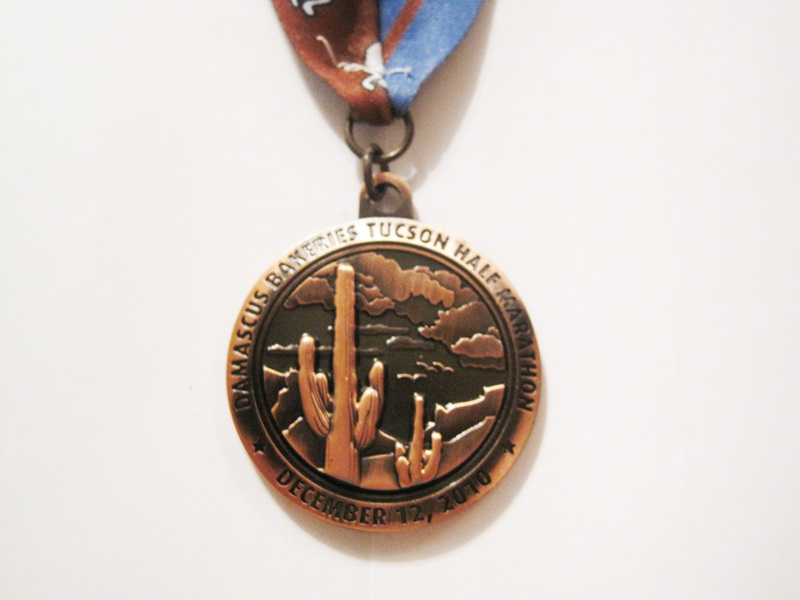 Its brown, copper color matches the race’s desert course, the design is more than just a simple drawing and the ribbon makes up for the actual medal’s monochromatic palette. Plus, I ran this race in 1:32, so that helps. 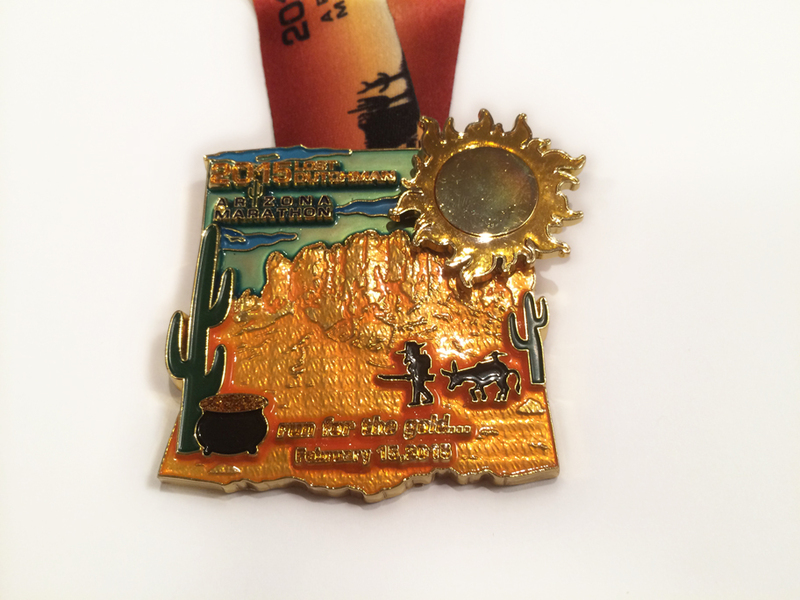 2015 Lost Dutchman Marathon – It’s fitting that a race that runs through the burnt reds and oranges of the southwestern desert under a perfect blue sky should have a colorful medal. Organizers ditched their usual subdued approach and went for a full explosion of color, from the ribbon down to the medal itself. As a novelty bonus, the sun’s heat rays rotate. 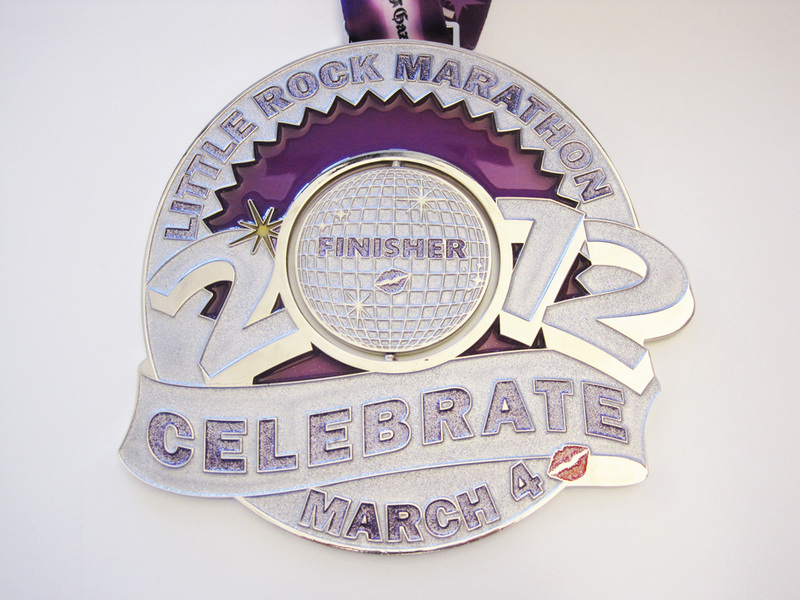 2012 Little Rock Marathon – This race prides itself on the size of its medals. As other races sprout up around the country offering large prizes, Arkansas has to up the ante. This year they went all out for their 10th anniversary in what can only be described as a huge, tacky, but loveable mess. The medal design changes considerably every year, but it’s always enormous (the center 0, for example, is roughly the size of most normal medals). 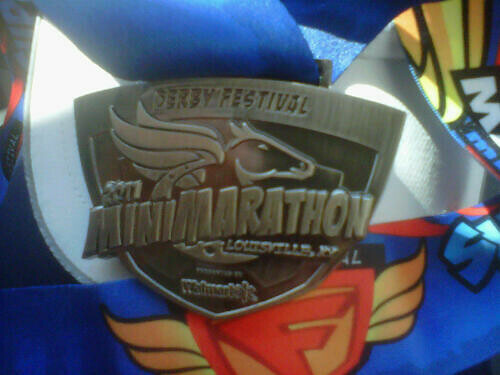 The corresponding half marathon medal is much smaller. 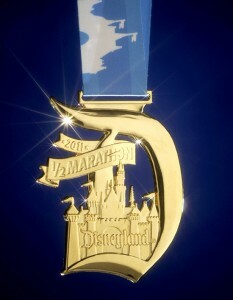 2010 Disneyland Half Marathon – The Disneyland Half Marathon medal was usually a huge golden silhouette of Sleeping Beauty’s iconic castle. For the 5th anniversary, race organizers took the castle and wrapped it in a large 5 and slapped Mickey in front to commemorate the milestone running. 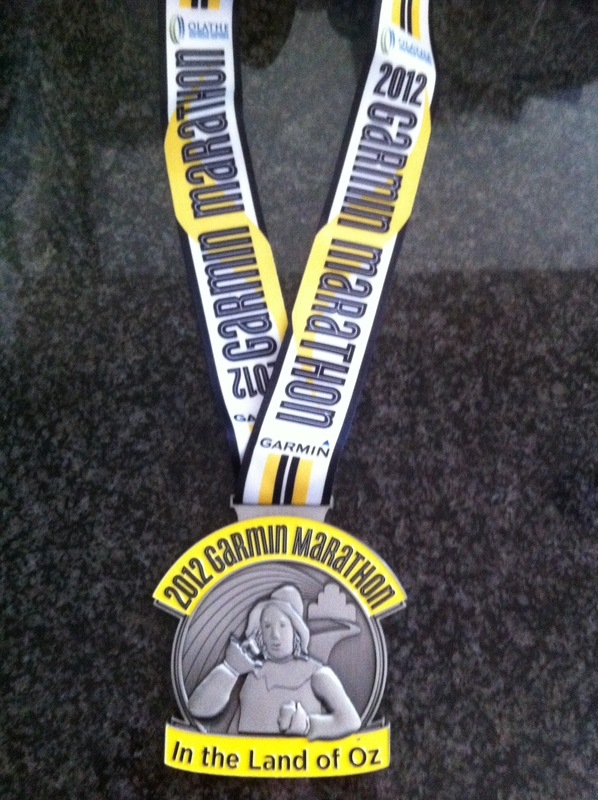 It’s not as large as the older medals, but still heavy and worth the hefty registration fee. Who knows if they’ll return to the classic silhouette, given that they created a completely new medal for the 6th running in 2011. 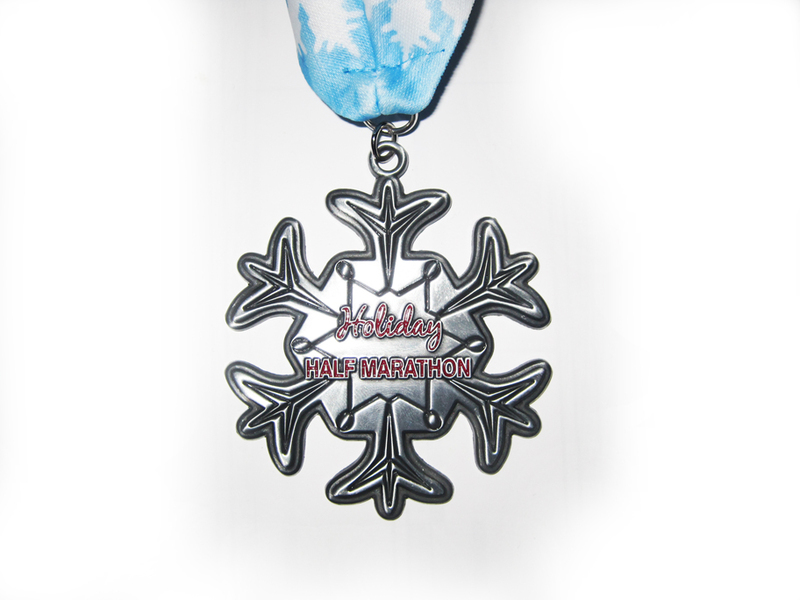 2011 Holiday Half Marathon – I very much enjoy this holiday-themed race and the ironically designed medal (there are no snowflakes in southern California in December). The ribbon is also a colorful light blue with red lettering with snowflakes throughout. A great race for just its third year. 2011 Horsetooth Half Marathon – The Horsetooth Half Marathon and its accompanying t-shirt do the same thing: intimidate runners with its intimidating elevation chart. Though it’s only for the first two miles that runners truly suffer through a 9% grade climb, the organizers make sure you don’t ever forget Monster Mountain. 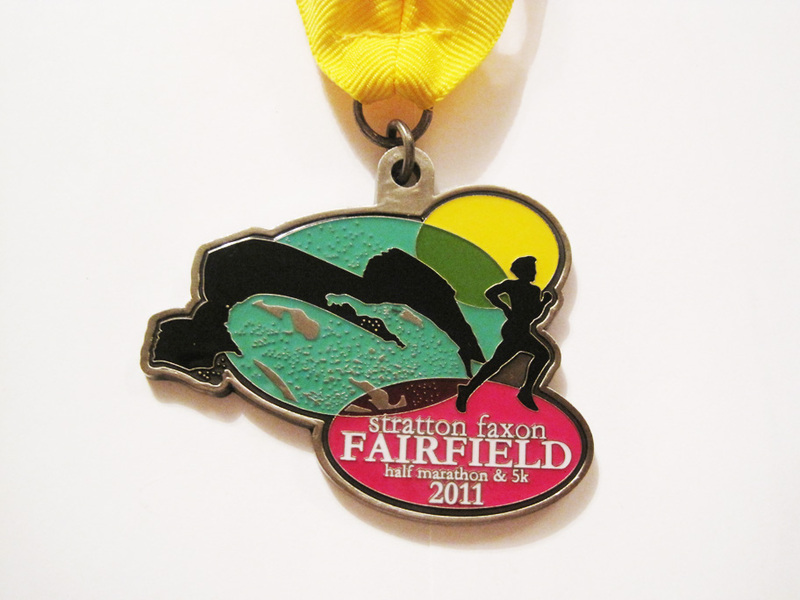 2011 Stratton Faxon Fairfield Half Marathon – This is one of my least favorite medals and the reasons should be obvious. The color palette is pretty ghastly, I have no idea what the lines on the left are supposed to be (though if I had to guess, I’d say waves) and the ribbon doesn’t make up for it. 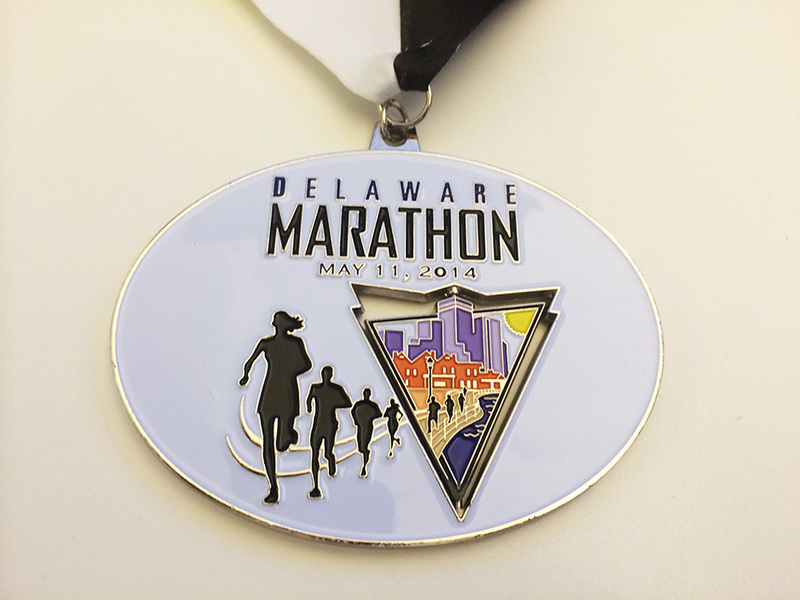 2014 Delaware Running Festival Marathon – This double-loop course offered a square medal to its half marathon finishers and an oval-shaped prize to the marathoners. The ribbons are also different colors depending on the distance and that downward arrow spins for marathoners only. However, it’s not perfectly cut out, so the spin is a little awkward. 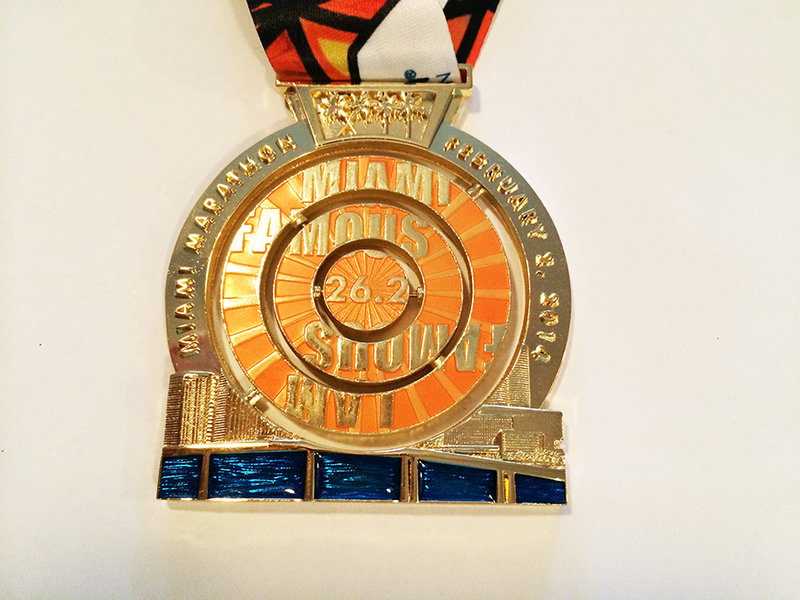 2010 ING Miami Half Marathon – Miami’s flashy, colorful medal has become a must-have for long-distance fanatics. The 2010 medal is the same as the 2009 make except with a slightly different color palette and the roman numeral “VIII” written in palm trees over the top. It’s a pretty large medal with two spinning components and a tiny diamond in the middle — definitely worth the warm, humid weather. 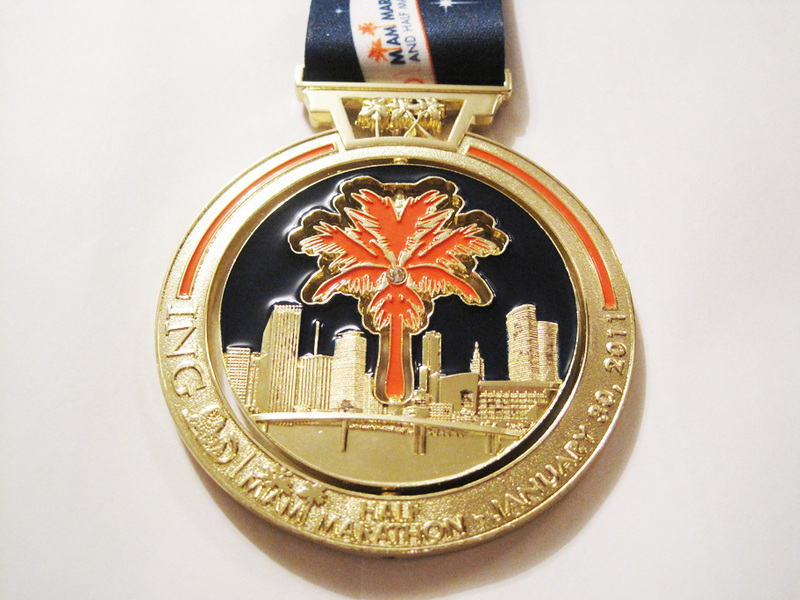 2011 ING Miami Half Marathon – The 2011 version of the half marathon medal added a few extra design elements. Instead of a solid backdrop for the palm tree, organizers added the Miami skyline on one side and “Miami Famous” on the back and the ribbon changed colors from orange to blue. Everything else runners had come to love about the design stayed the same. 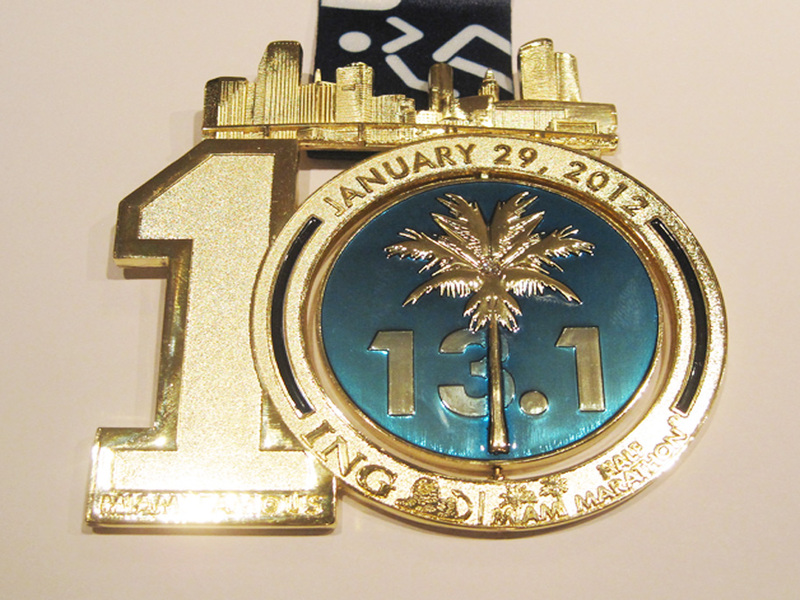 2012 ING Miami Half Marathon – For the 10th anniversary of the race, organizers decided to stick with the popular spinning palm. Though previous medals have had two separately spinning layers, this one has just one circle. However, it definitely makes up for the fewer moving parts by being enormous. The skyline was also moved from the inset to the top, which was a nice touch, despite Miami not having particularly recognizable buildings. It’s a huge medal worthy of the 10-year honor. 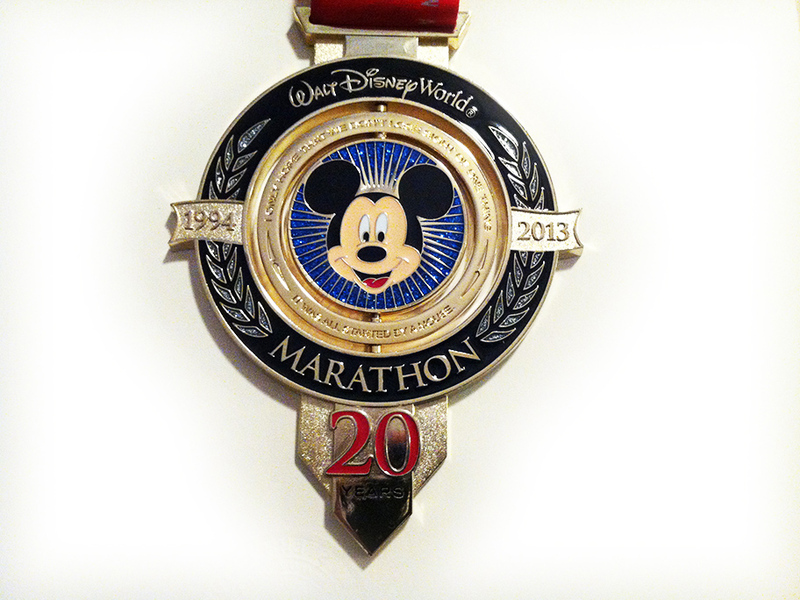 2013 Walt Disney World Marathon – With the exception of their 15th anniversary, the Disney World Marathon medal is usually a large hunk of gold, usually with Mickey ears or with the mouse mid-run. However, for the commemorative 20th anniversary, they put together a truly elegant medal that pays tribute to Walt Disney and his most famous creation. 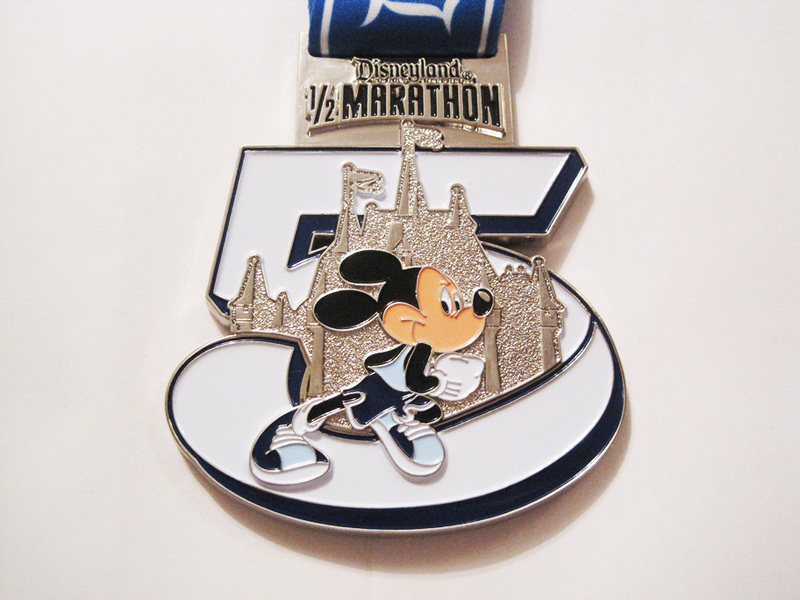 Similar to the 2011 ING Miami Marathon medal, it features two spinning layers, with an old-school black and white Mickey on the back and laurels gracing the sides. It’s going to be tough to top this medal. 2014 Lifetime Fitness Miami Marathon – Organizers abandoned their spinning palm idea for the first time in years, but the result is breathtakingly beautiful. Not only did they retain the gold, blue and orange color palette, but they changed the axis of several spinning rings, giving this medal the look of a perpetual motion machine. I thought they would phone it in after losing their long-standing titular sponsor, ING. Fortunately, that did not happen and both medal and ribbon delivered on wow factor. 2015 Lifetime Fitness Miami Half Marathon – Are you starting to see a pattern? It seems like the organizers of this race pick a mold, and then add something to it every year until it becomes a bloated hodgepodge of elements. The medal is basically the 2014 design but with the tacky “MIAMI” and “FAMOUS” block letters on the side and more palm trees. Unless they “reset” their design again (like they did in 2009 and 2014), I’m a little worried for 2016. 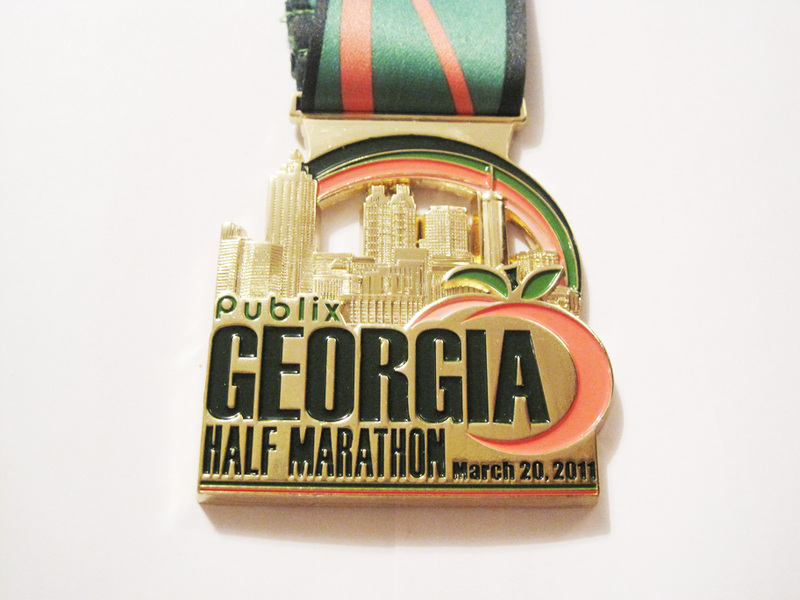 2011 Publix Georgia Half Marathon – It was the first year that Publix acted as title sponsor to this race. 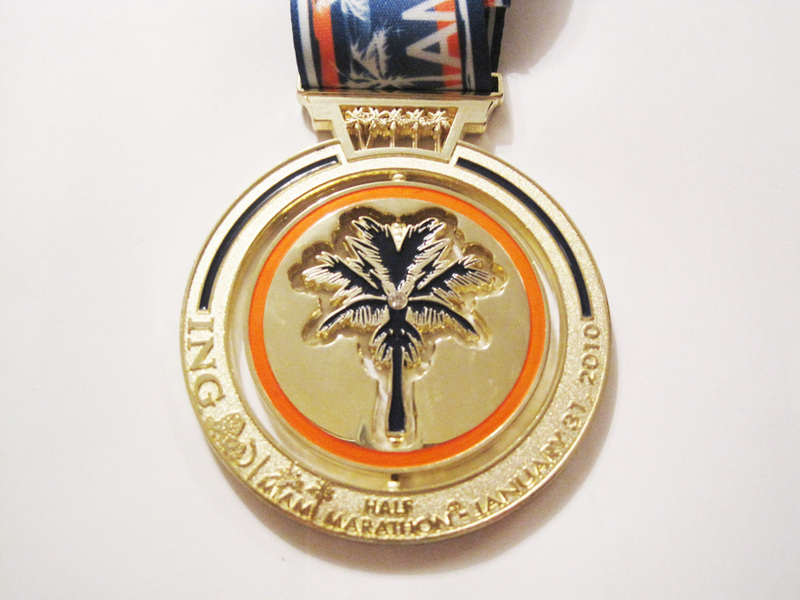 Prior to 2011, ING was the main sponsor and the medal was either the shape of the state of Georgia or a peach. This year, organizers decided to combine the state fruit with the capital skyline. 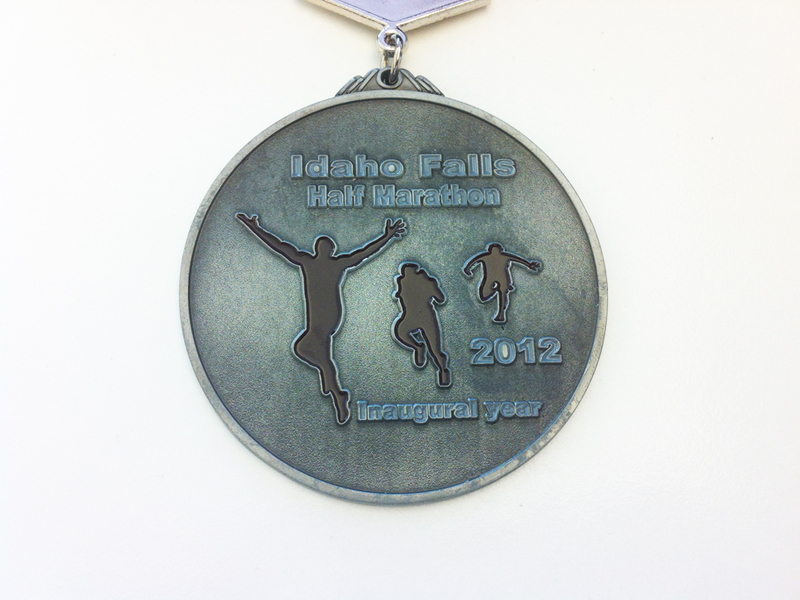 2012 Idaho Falls Half Marathon – You always have to give races a pass if it’s their first year. Though the organization and execution of the race was very impressive given the tiny field (under 200 runners) and point-to-point course, the medal is obviously lacking in design and wow factor. Give it a few more years and they’ll probably up their zazz but for now, very forgettable. 2009 Spring Half Marathon – This was my first half marathon ever and it wasn’t until I crossed the finish line that I realized all finishers got medals. In other words, when your expectations are nil, anything you receive satisfies you. It’s a good thing too, because this medal is tiny, very abstract and difficult to read. Had this been my third, fourth, or twenty-eighth half marathon, I would have been very irate. 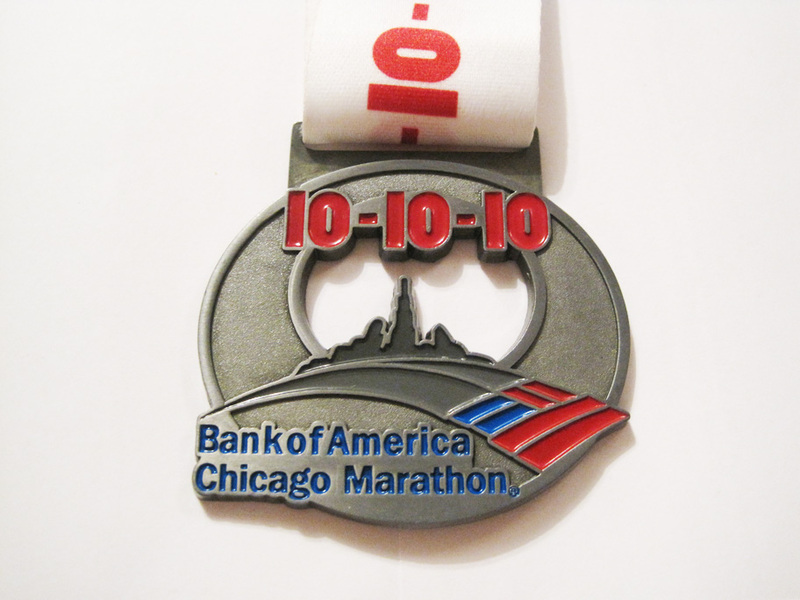 2009 13.1 Marathon Chicago – This medal is the definition of race bling. It’s heavy, it’s shiny, it’s almost ostentatious, and that’s why it’s awesome. 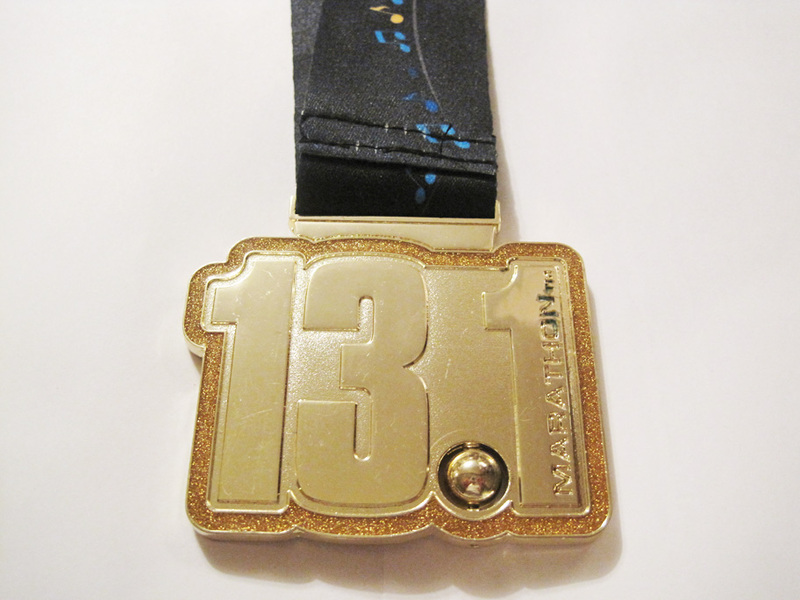 The only downside is that all other 13.1 races had that same design in 2009 with only the ribbon changing. In fact, I believe the 13.1 series of races does the same medal for every race, but changes it yearly. 2009 Chicago Half Marathon – The Chicago skyline is a popular theme for most races. The Sears Tower, Hancock Center and the Smurfit-Stone Building make up the bulk of this medal, which is actually quite heavy. 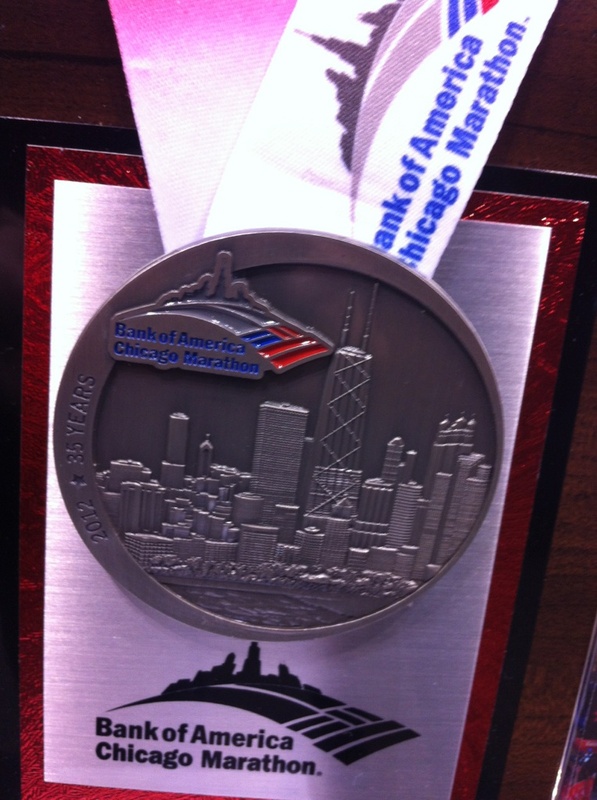 2009 Bank of America Chicago Marathon – I was lucky to receive this medal for my first marathon. In the regal shape of a shield and emblazoned with a large footprint, it was the perfect token to commemorate a year’s worth of training and nervous anticipation. 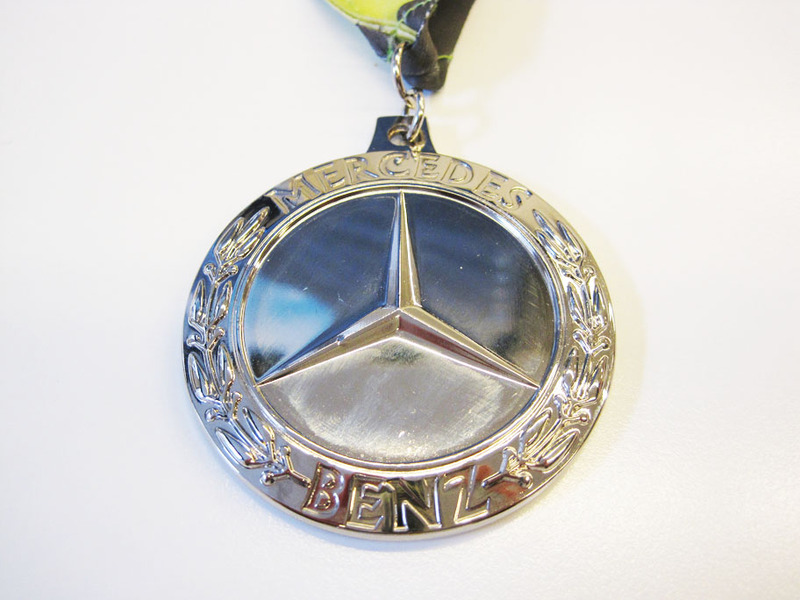 Plus, the 2008 medal was ugly. 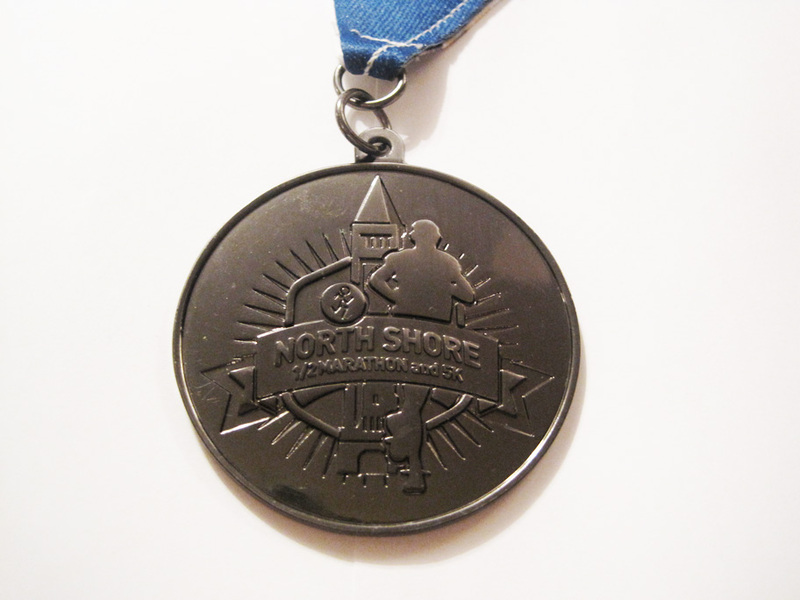 2010 North Shore Half Marathon – While the race course is very pretty, this medal is obviously not. However, this can be forgiven because all runners received flip flops, a towel and a backpack, which I use all the time as a gym bag. In the absence of this amazing swag, I would have been much more disappointed with this boring black circle. 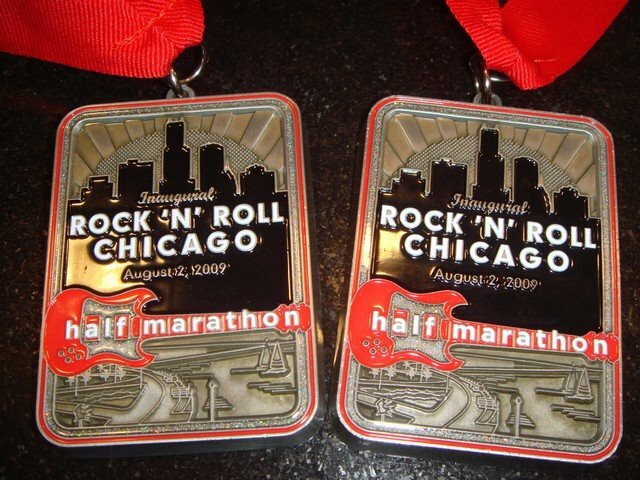 2010 Rock ‘n Roll Chicago Half Marathon – As a race with only three runnings so far, this has been the best medal of the three. 2009‘s was decent but clunky and 2011‘s was also a bit uneven (for lack of a better word). 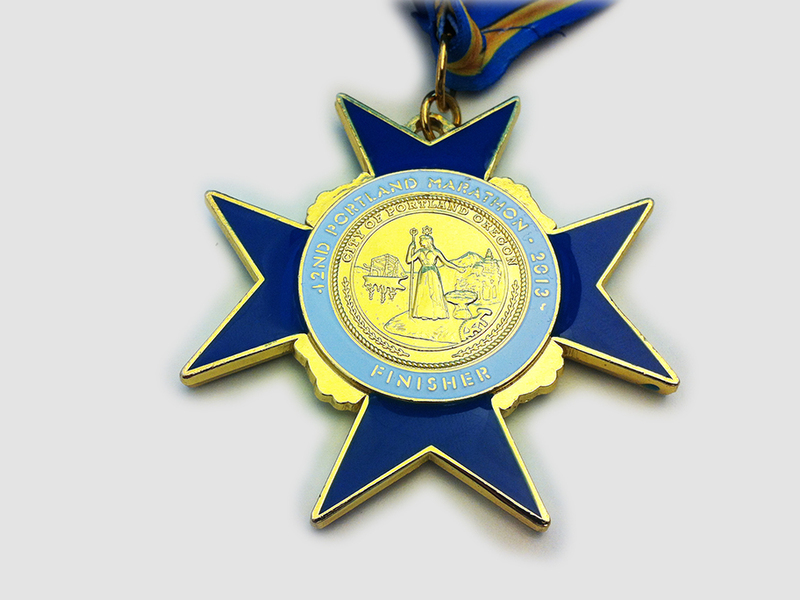 The 2010 medal, though, was an effective use of space, neatly set in a classic circle. 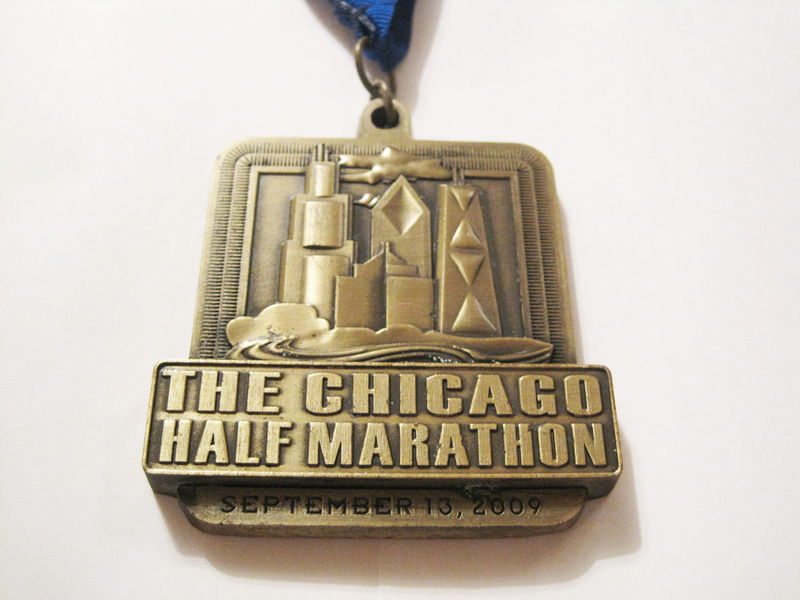 2010 Chicago Half Marathon – The design changed somewhat from the year before, but veterans will recognize that it is mostly the same. A starry arch covers the same skyline and the ribbon changed from a simple blue sash to a white and green one with the race name and logo printed on it. A definite improvement over a safe concept (though I’m not too crazy about the 2011 design). 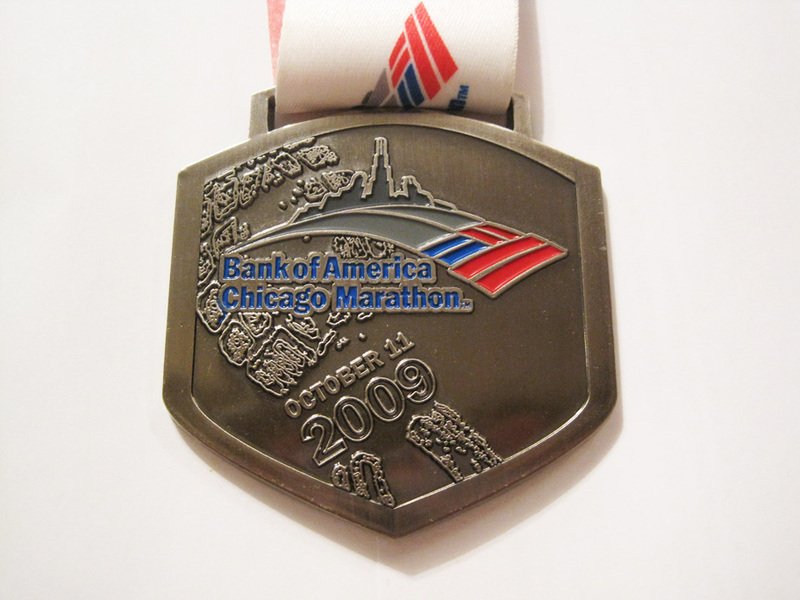 2010 Bank of America Chicago Marathon – You’re never truly disappointed in a marathon medal upon finishing. They could give you a wad of gum tied to human hair and you’d cherish it for that moment. That’s how I felt about this medal. After the post-race high, I looked at it again and thought, they had so much potential with the 10-10-10 date and this is what they did with it? 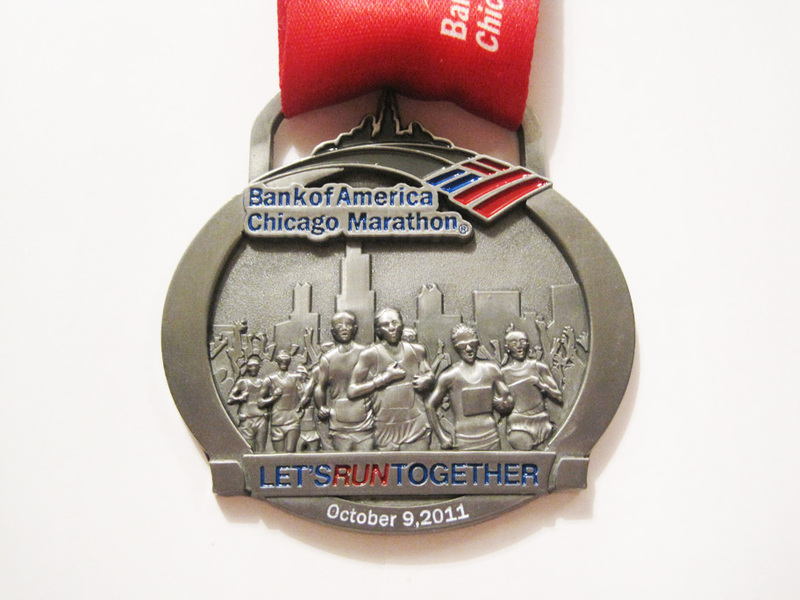 2011 Bank of America Chicago Marathon – The race organizers kept the same simple gray circle design from the past year but added the theme of the year (“Let’s Run Together”) and a field of runners, a bit reminiscent of the 2006 New York City Marathon medal. I liked the look, despite the fact that it didn’t trump 2009’s design. 2012’s medal came with even more detail, this time showing off the Hancock Tower instead of the more famous Sears. 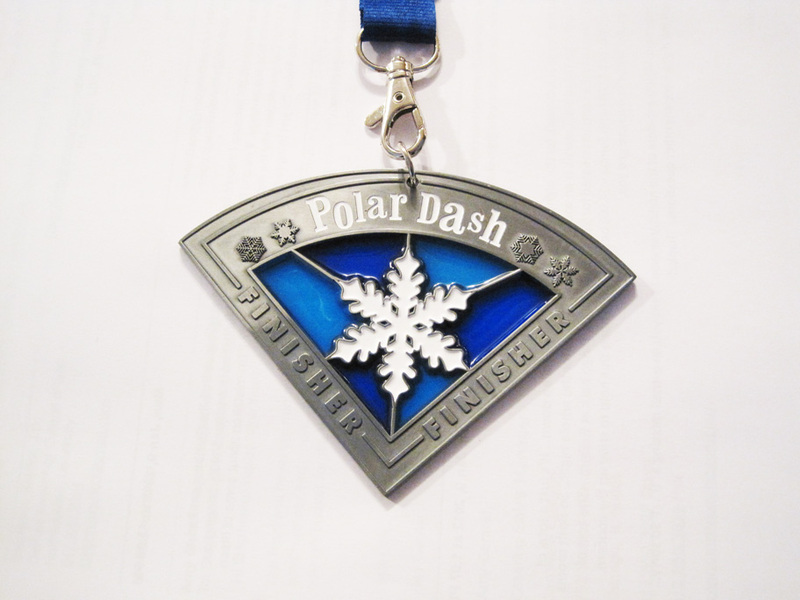 2012 Polar Dash Half Marathon – This is part of a series of races that was created by Team Ortho, originally in Minneapolis. Each medal from that series was 1/4 of a larger circle, with the same basic design on each. It’s a large, yet thin slab with stained glass pieces surrounding the center image. It’s nice, except that this one doesn’t say “Chicago” or “Half Marathon” anywhere on it, meaning it’s probably exactly the same as the Minneapolis race (and it was also given to all 10k finishers). 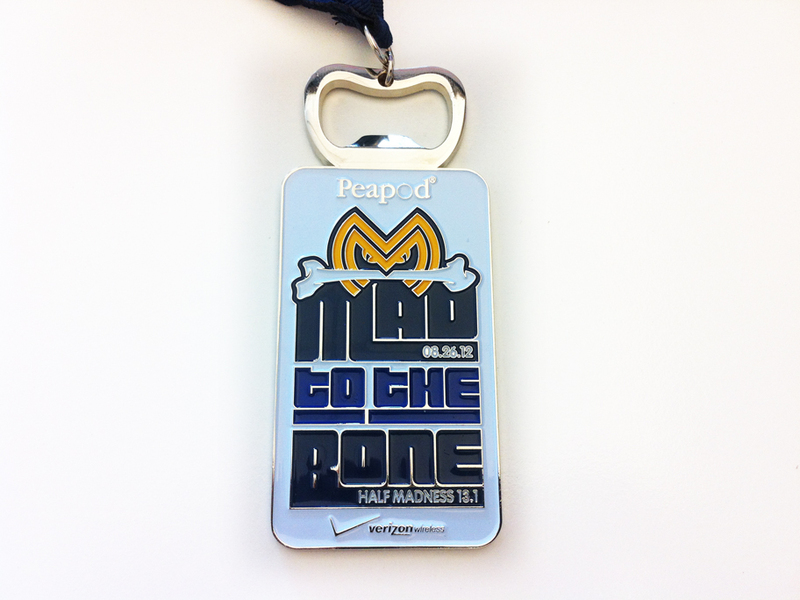 2012 HalfMadness Half Marathon – It’s becoming popular to tack on a bottle opener to finishers medals. As someone who prefers to proudly display his medals than actually use them (and therefore keep them in a kitchen drawer), this gimmick does nothing for me. But I do appreciate how they minimized the sponsors and went for bright colors. 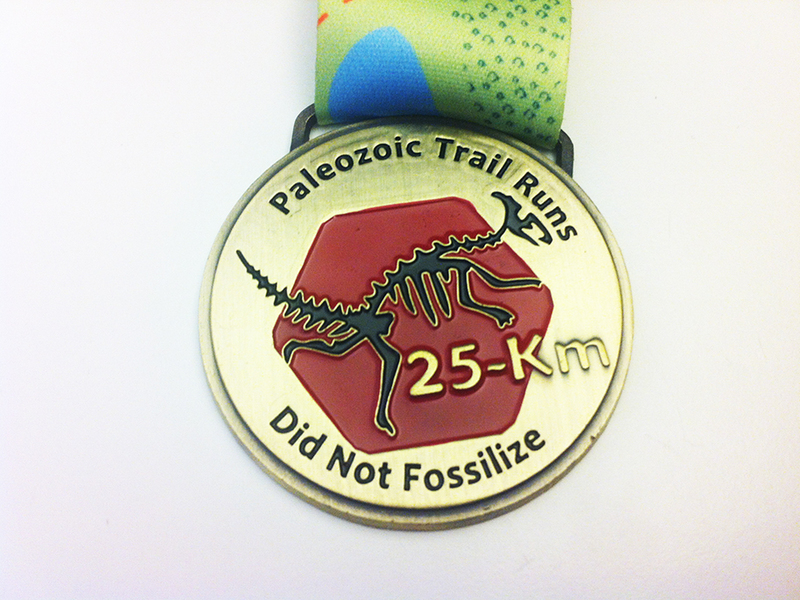 2013 Paleozoic Trail Run 25k – I was very pleasantly surprised by this medal. 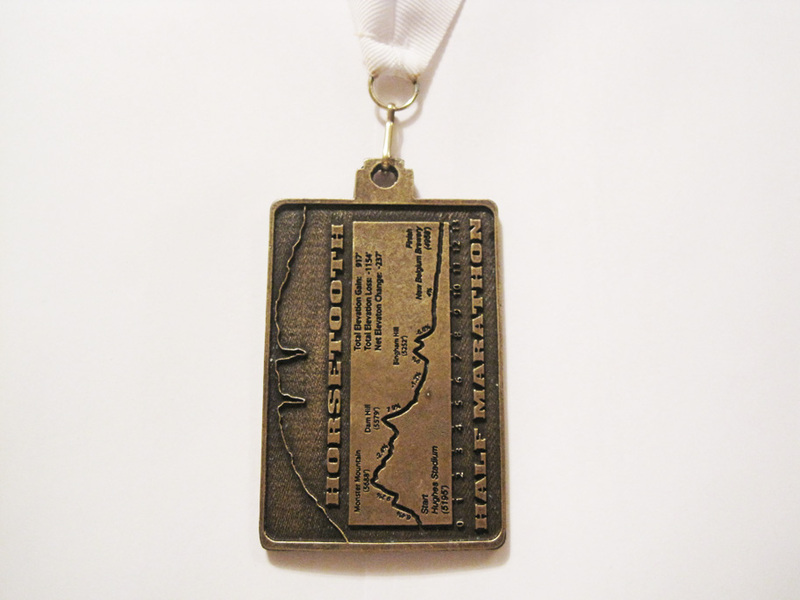 Given that it was an inaugural trail run of just about 200 people, this hefty, distance-specific and detailed medal comes with a colorful ribbon. I was expecting a generic decal, so the engraved dinosaur skeleton was a huge step up. The event was not without many flaws, but this was not one of them. 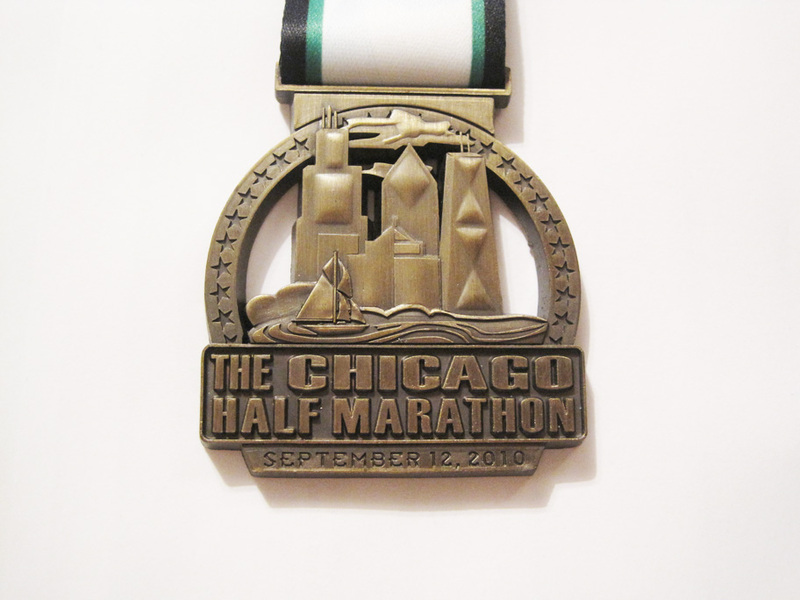 2014 13.1 Marathon Chicago – Although the event itself hasn’t changed much since its inaugural race in 2009, the medals and sponsorships certainly have. The original design was a giant 13.1 with a sphere serving as the point, with little else. 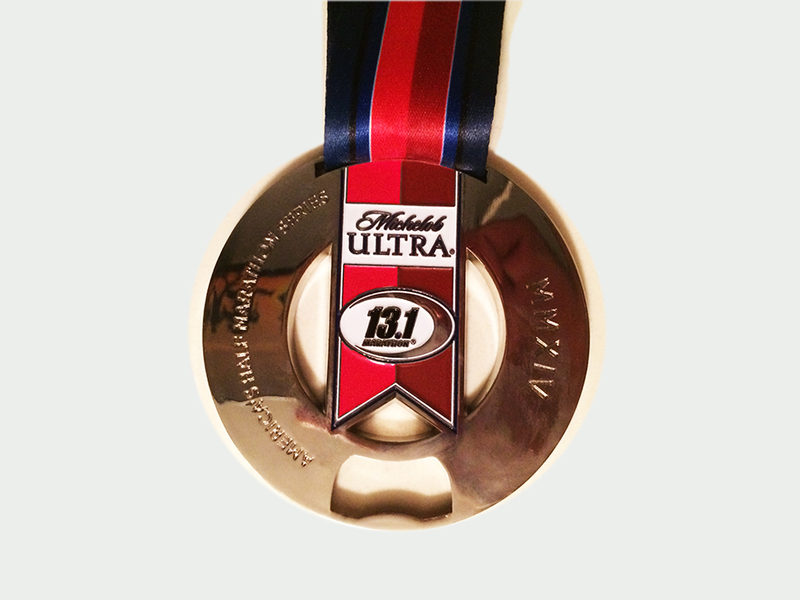 In the years since, Allstate took over as the title sponsor, followed by Michelob Ultra, which feature a little too prominently in the otherwise elegant, circular design. I believe every race in the country has the same design, with only the city changing. 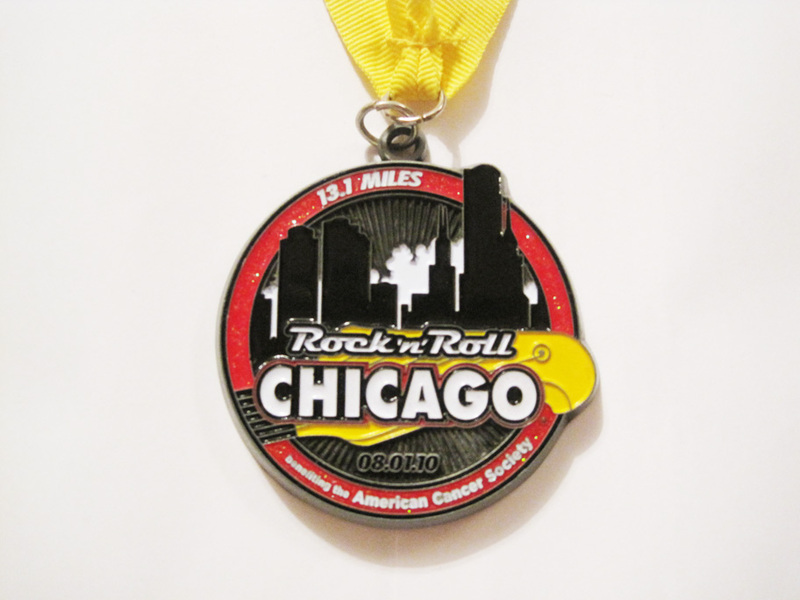 2014 Rock ‘n Roll Chicago Half Marathon – Some people love the medals for RNR races, some people find them too generic and uninspired. I tend to find that at least for Chicago, the organizers go out of their way to find buildings or landmarks that aren’t the expected Sears and Hancock Towers, which I appreciate as a local. This year features the crowd favorite Cloud Gate (more commonly known as the Bean) and a few architecturally appealing (yet otherwise commonplace) buildings. It’s colorful, shiny, and that’s good enough for me. 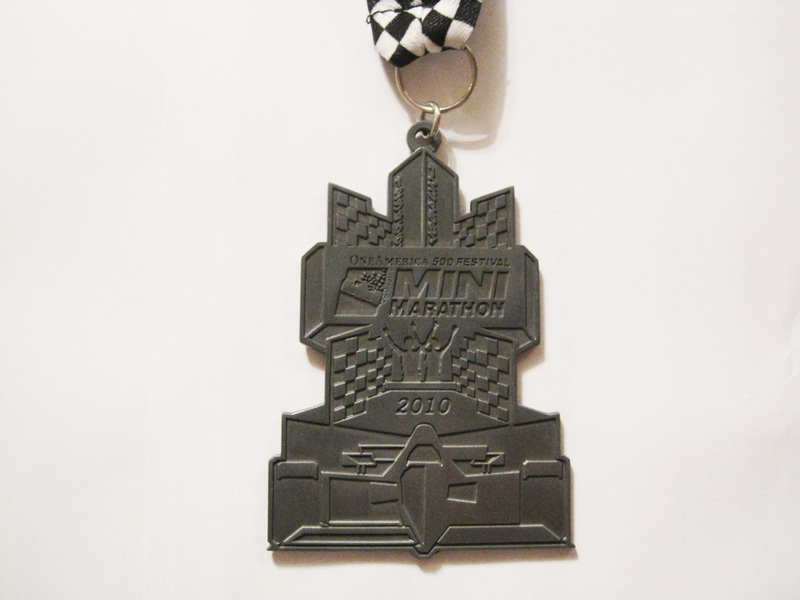 2010 OneAmerica 500 Festival Mini-Marathon – Worst medal ever. Proves that even running a PR can’t distract you enough to notice you were just given a thin, dull knickknack that you can barely recognize. 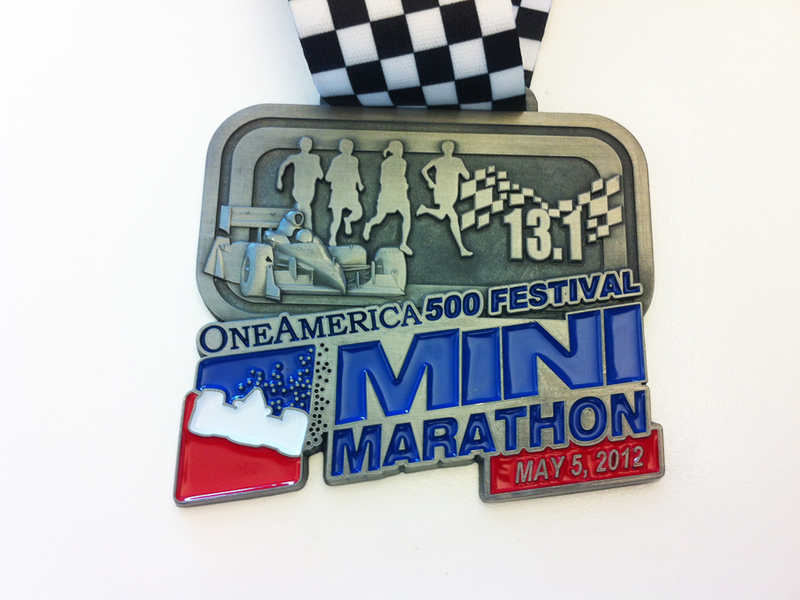 2012 OneAmerica 500 Festival Mini-Marathon – Much better. Organizers must have either received many complaints or noticed themselves that a race billed as the largest in the country should have a decent medal at the very least. The design is very similar to 2011‘s, which was awesome, so no complaints from me. 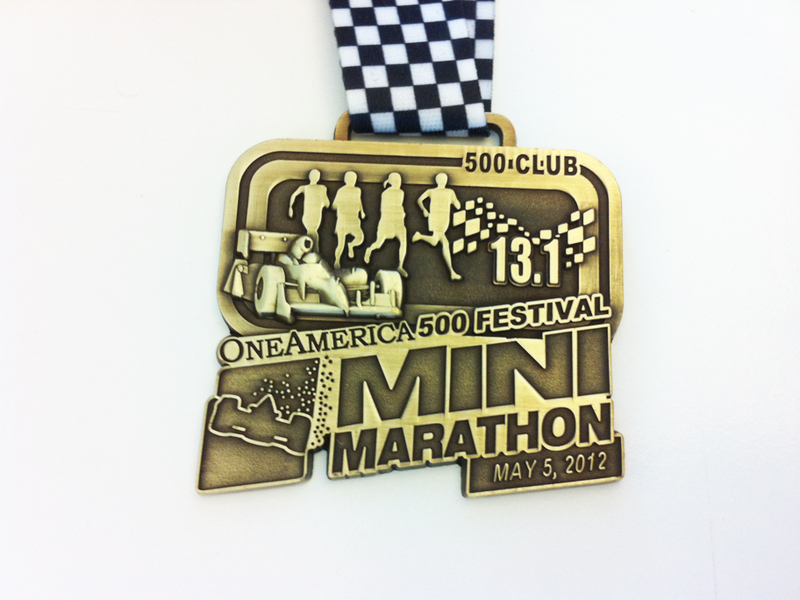 2012 OneAmerica 500 Festival Mini-Marathon 500 Club Medal – This medal is given to the first 500 finishers of the OneAmerica 500 Festival Mini-Marathon. The cutoff is usually in the 1:29 range, but high humidity slowed the field down by three minutes in 2012, allowing me to weasel my way into the exclusive club. 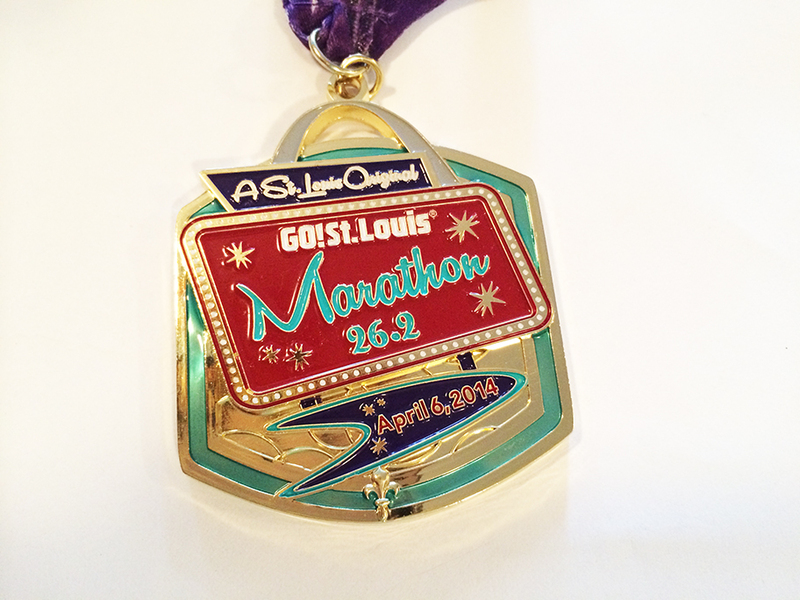 It’s exactly the same as the finisher’s medal except smaller, “golden” and says “500 Club” in the upper right corner. 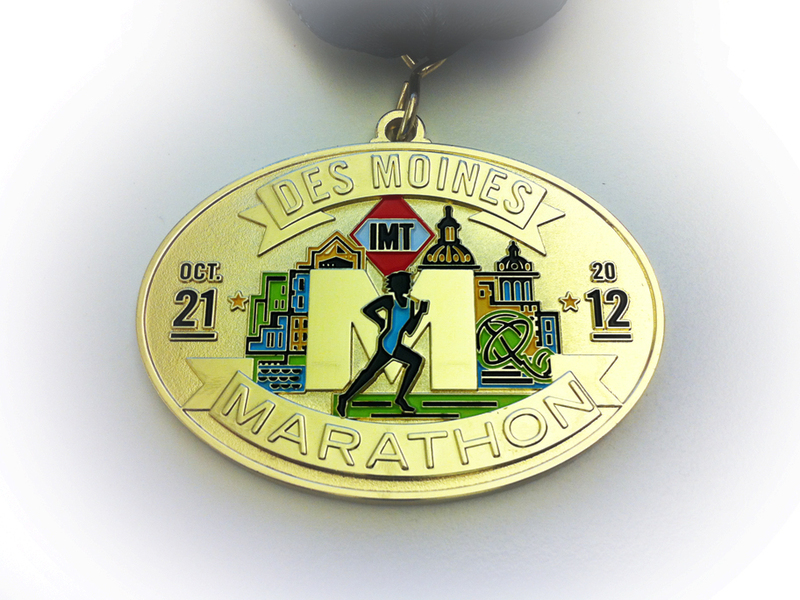 2012 IMT Des Moines Marathon – It seemed like this medal didn’t change from year to year. It was usually a simple dark grey oval with the race logo and date beneath. I was surprised this year to receive this golden medallion with little confetti-like bits of color. It’s nothing special, but you can tell there was some love put into the design. Then again, I’m biased because I scorched my old PR before earning this. 2013 Garmin Marathon in the Land of Oz – No marathon in Kansas would be complete without reference to L. Frank Baum’s iconic novel. 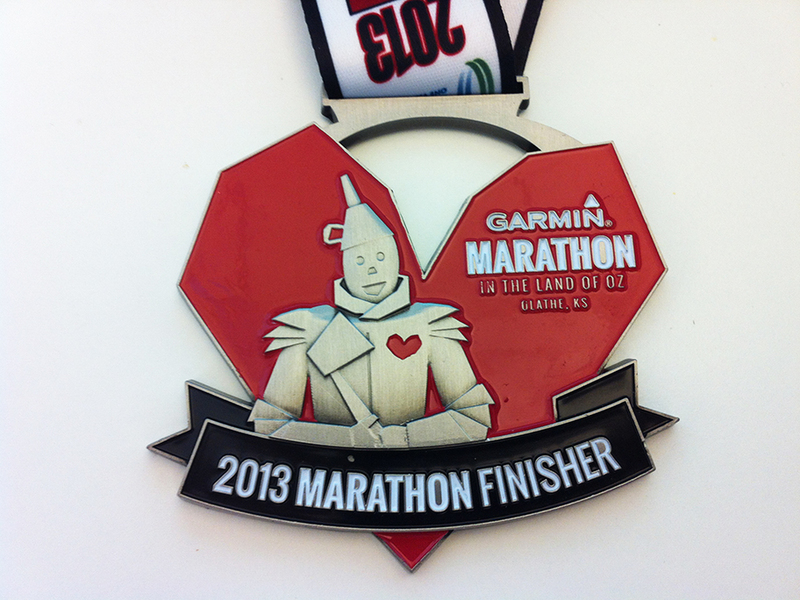 This year’s medal features the Tin Man and the one thing he seeks: a heart. It is large, cute and sharp around the edges. The 2012 medal was yellow and featured the Scarecrow, so it’s likely that next year will be the Cowardly Lion’s debut, though I don’t know what color would represent courage. 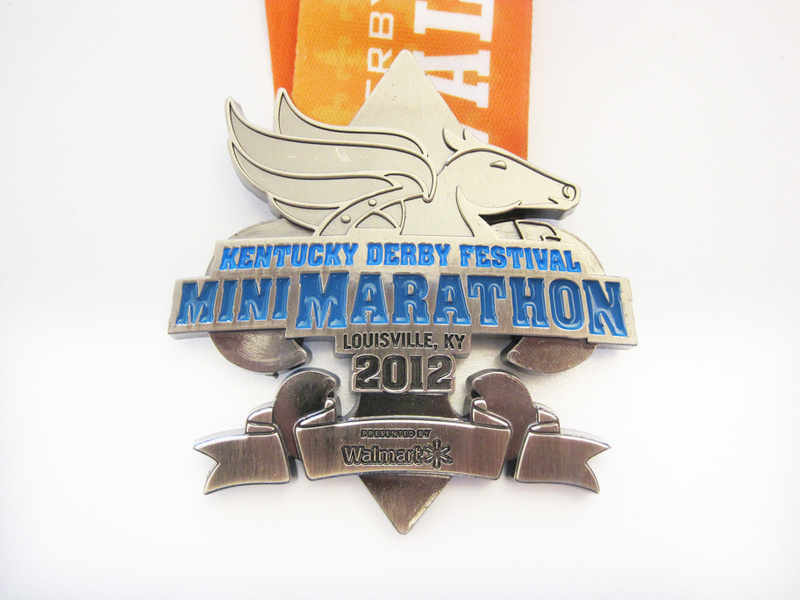 2012 Kentucky Derby Festival miniMarathon – This medal features a winged horse atop a fleur de lys, attached to a very colorful blue/orange ribbon. 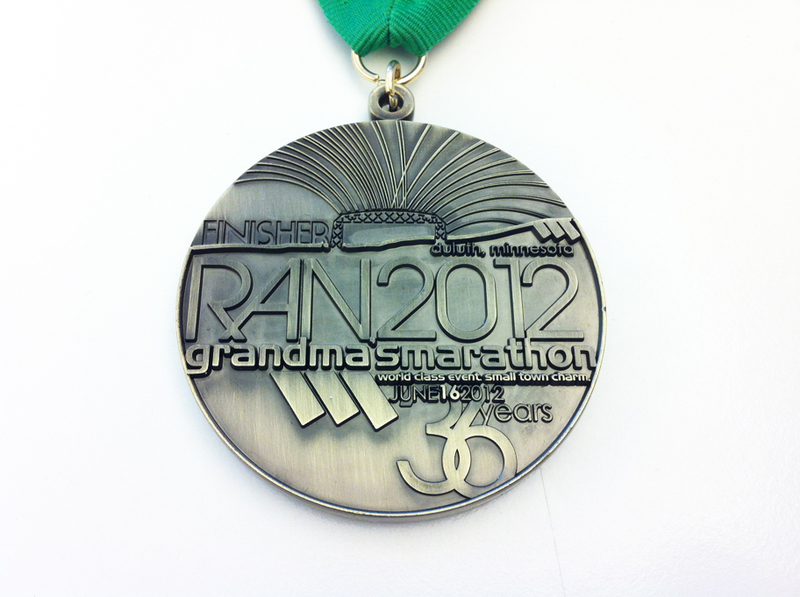 Although it’s not as in-your-face as 2011’s medal, it was appropriately regal for its historic namesake. I was worried that the “Presented by Walmart” would encroach too much on the design, but fortunately it’s tucked away appropriately. 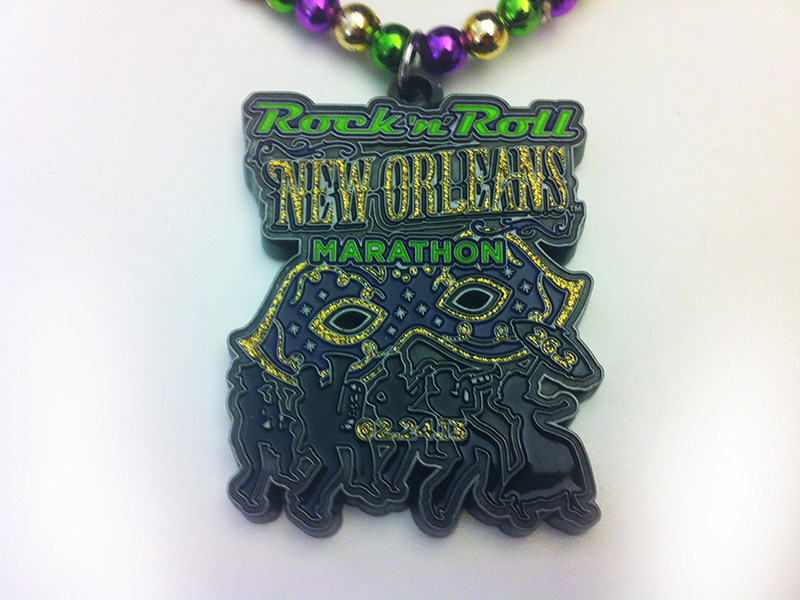 2013 Rock ‘n Roll New Orleans Marathon – Some people criticize the Rock ‘n Roll medals as being all the same, but in this case I have to disagree. Every year they warmly embrace New Orleans’ culture and try to infuse their finisher’s hunk with as much Mardis Gras as possible. This year’s was no exception, with designers showcasing the city’s hallmark elements of jazz and masqueraded frivolity. But what really sells it is the beaded necklace from which it hangs. 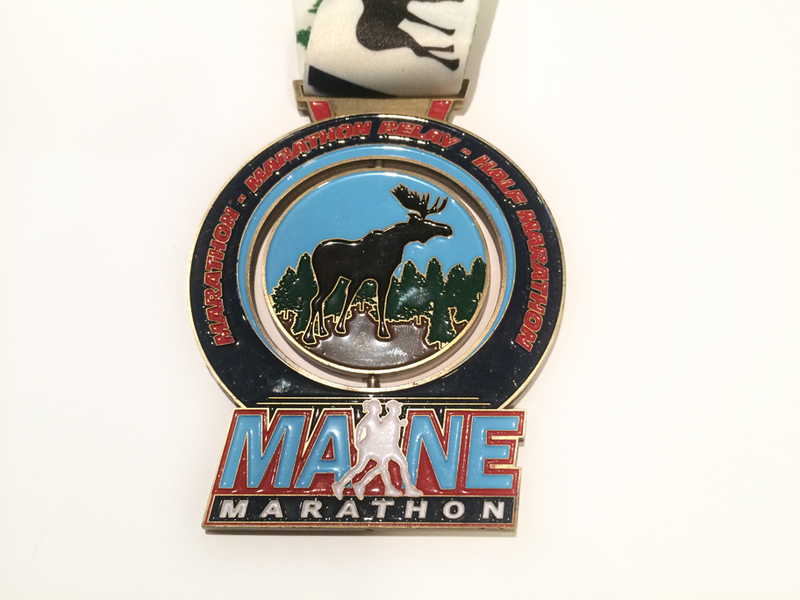 2014 Maine Half Marathon – This race hands out a heavy and colorful finisher’s medal with a spinning component featuring the silhouette of a moose. Though the race itself isn’t as rugged as the medal suggests, it’s a nice addition to anyone’s medal rack. 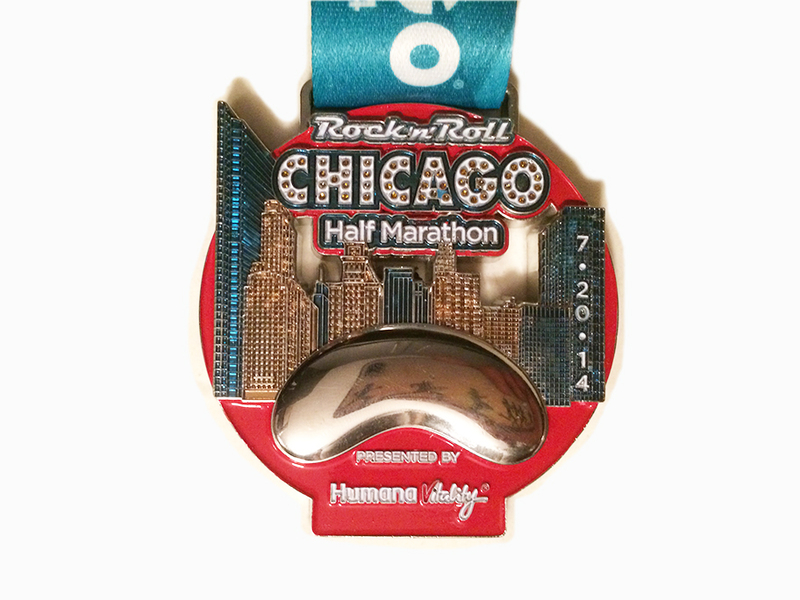 The half marathon medal is no different though, so it’s up to you to explain that to your friends and family. 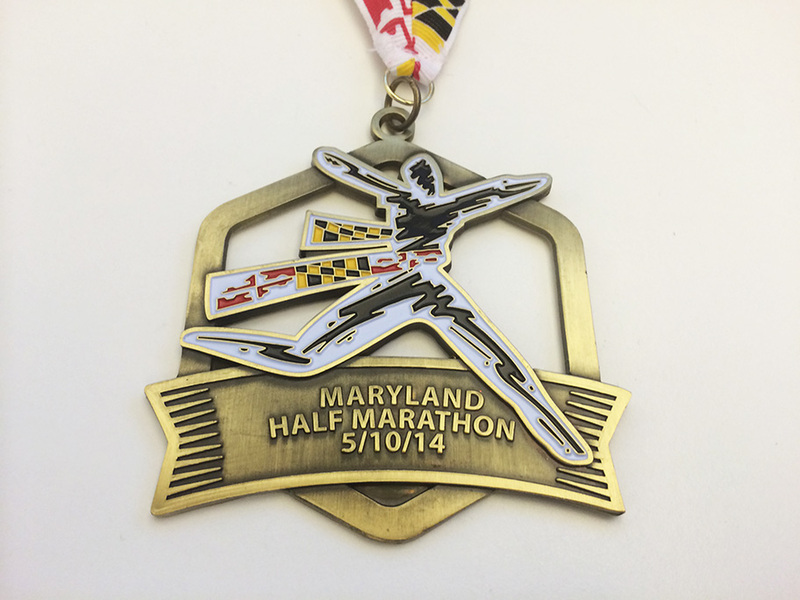 2014 Maryland Half Marathon – I always downplay my expectations for small races in rural areas, so I was pleasantly surprised by this medal. 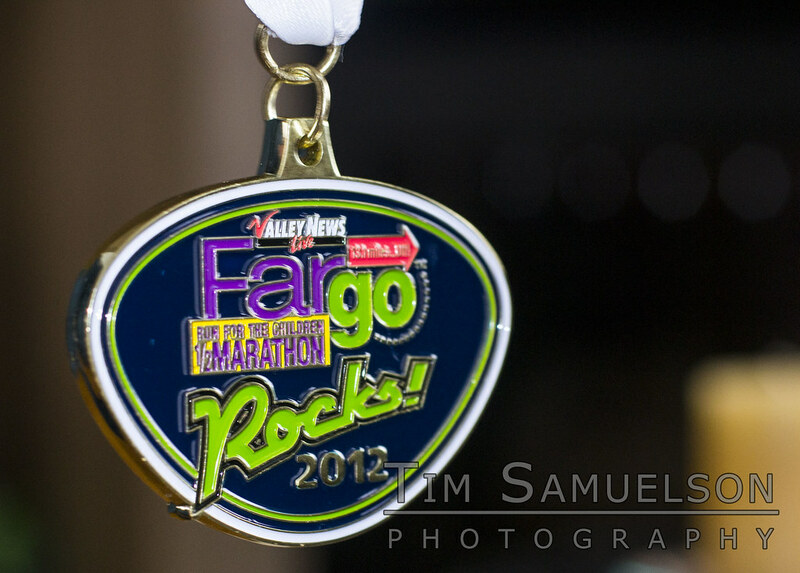 It bears the logo of the race, displays the date, uses negative space, and has a matching, colorful ribbon. Truthfully though, I was already pleasantly surprised by the UnderArmour t-shirt that all participants get. I guess that’s what Maryland does (in addition to crabcakes). 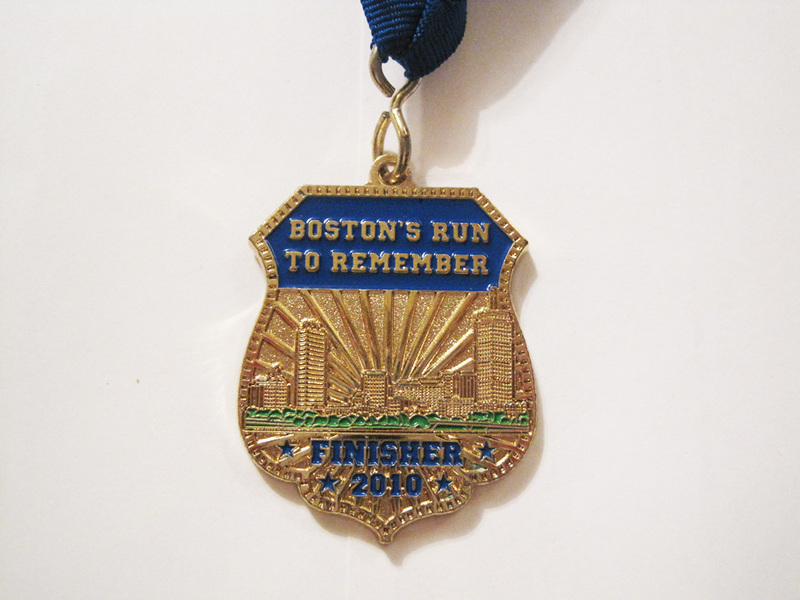 2010 Boston’s Run to Remember – This medal is tiny. But it is shaped like a badge, which fits the race theme of paying tribute to Massachusetts Law Enforcement Officers who have lost their lives while on duty. In addition, it has the Boston skyline in the middle, thus serving as a nice example of big things in small packages. The 2011 medal was similar, but in silver. 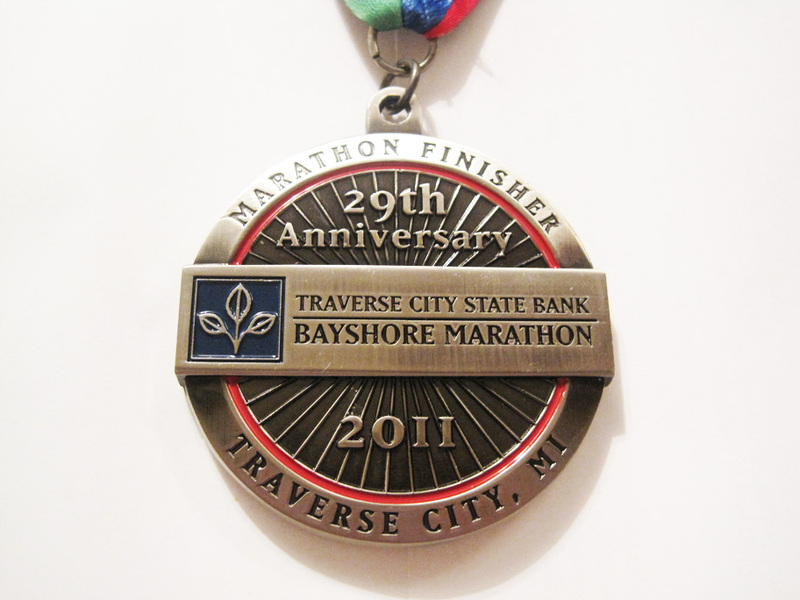 2011 Traverse City State Bank Bayshore Marathon – There’s nothing particularly noteworthy or outstanding about this medal, but it’s thick, robust, has all the necessary information on it, comes with a colorful ribbon and changes little year to year. Then again, most runners go for the serene course, the picturesque Grand Traverse Bay and the small-town comfort. 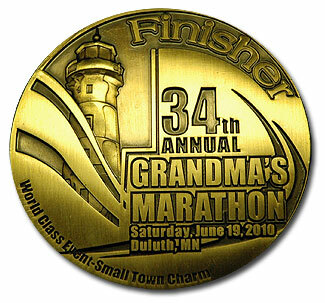 2012 Grandma’s Marathon – Every year,this race puts out a very detailed, monochromatic medal with a landmark of the surrounding area. Recently, they’ve showcased a lighthouse, the large steel structure by the harbor, and a bridge. This year they stepped away from more traditional designs and adopted a modern look. I wasn’t thrilled with the aesthetic change, but I’m sure over time I’ll come to enjoy it more. 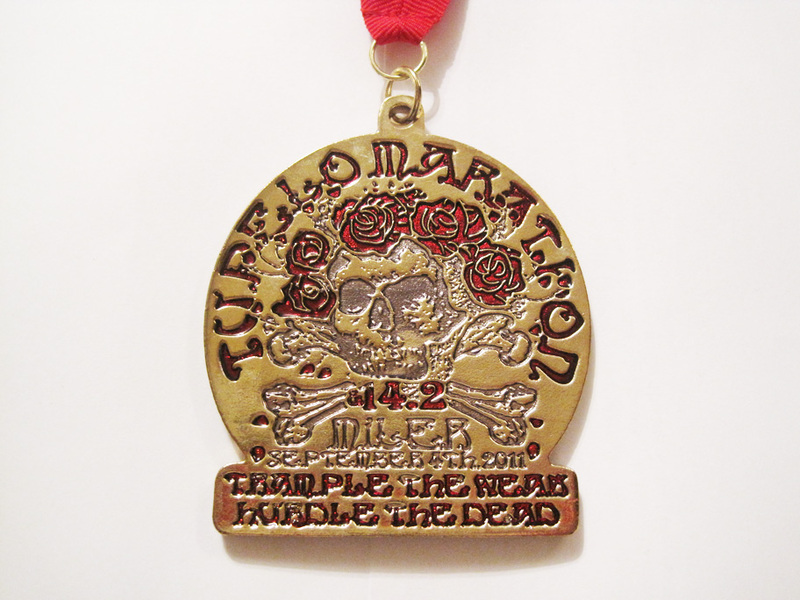 2011 Tupelo Marathon -The skull & crossbones medal has become a staple of this tiny, 250-person marathon in rural Mississippi. The accessories change, but there’s always a skull. This year they adopted a Grateful Dead theme and used a shiny, gold metal instead of their more grimy materials of years past. It ends up looking a bit like pirate’s gold, which is great, but the font choice was less than ideal. 2010 Go! St. Louis Half Marathon – St. Louis is doomed to have its Gateway Arch forever represent its city … and that’s just fine because it’s a pretty awesome structure. This medal does just that, but adds a strange, additional loop for the ribbon – I guess if the Arch had served that purpose, you wouldn’t notice it as much. Regardless, a great medal. 2014 Go! 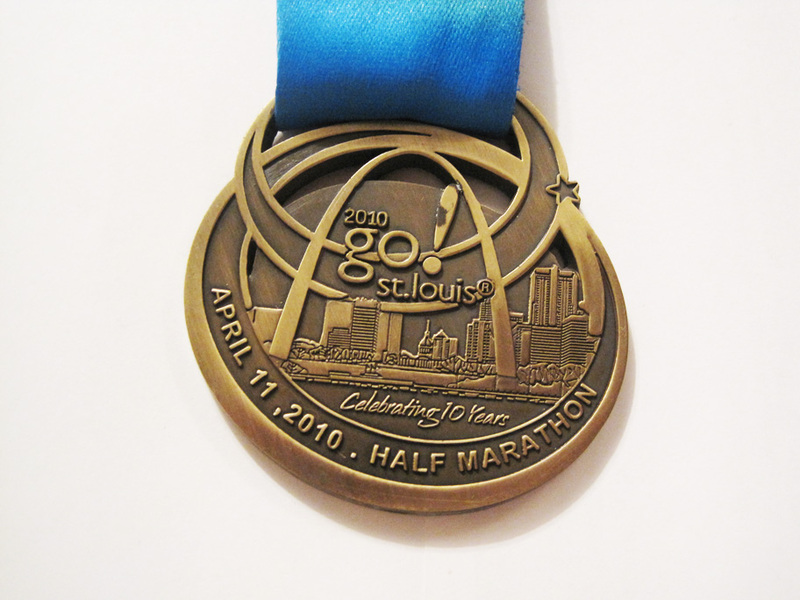 St. Louis Marathon – This is a medal that is completely different every year, but will always feature the city’s signature Gateway Arch. It’s so iconic and instantly recognizable, so who can blame them? This year they opted for a retro-style look, which first struck me as a play on the famous Welcome to Las Vegas sign. The ribbon is equally colorful, making this a delightful prize for a hilly course. 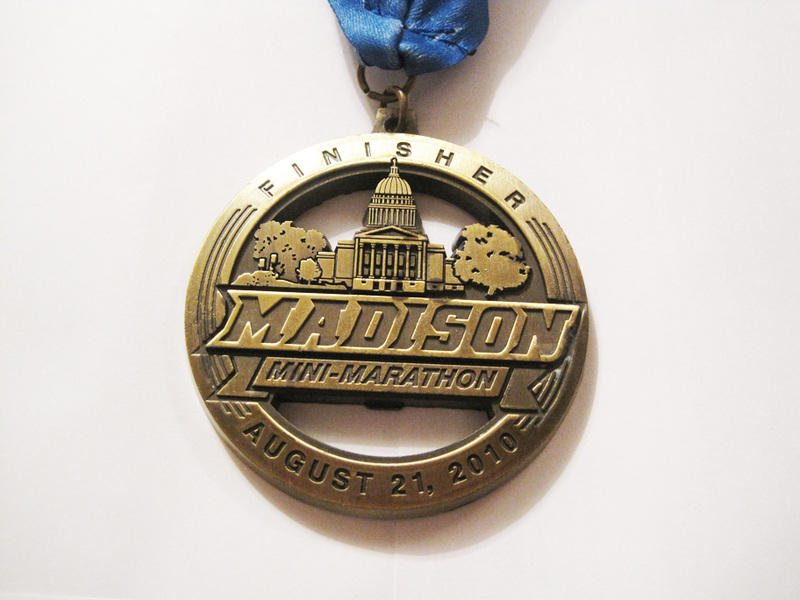 2012 Madison Half Marathon – Given that the race was in the middle of nowhere, fields just under 200 runners and tries its hardest to minimize its impact on the environment, I was pleasantly surprised with this medal. I was expecting a generic circle with Hermes sandals or an American flag and instead got this nice decal with the race’s logo and altitude proudly stamped on it. Nitpicky complaint: there’s no unique medal for the half marathon finishers. 2012 Hoover Dam Marathon – Calico Racing, despite putting together relatively small races, always delivers a medal befitting of the event. This one features both the Hoover Dam and the new bypass in a square frame, along with their cat logo. I wish they had added a date and even specified which distance was run but I suppose an event as spartanly run as this one needs to cut some corners. Nice medal for a great race. 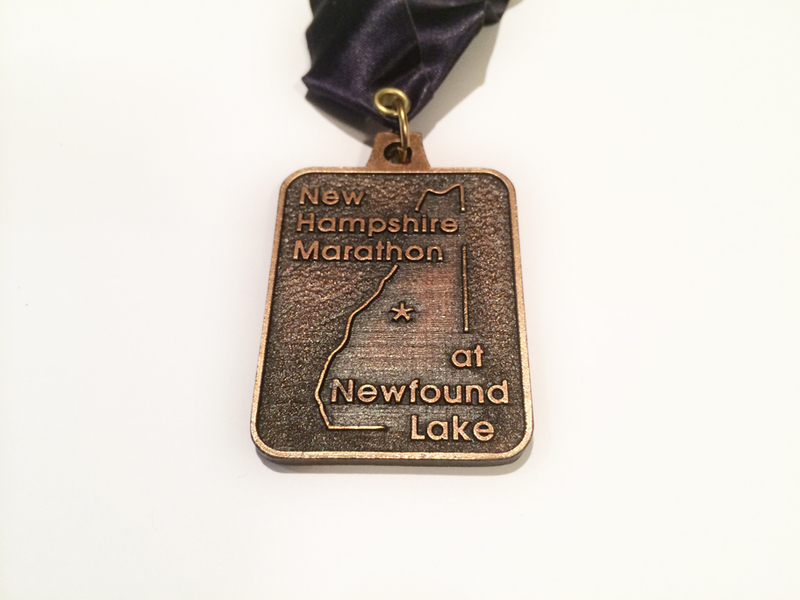 2014 New Hampshire Marathon – This is, thus far, the smallest medal I have ever received. But after the stunning views of Bristol’s autumn foliage, serene mirror-like lakes and friendly community, I would have welcomed a piece of park with a ribbon made of dental floss. But as a warning to anyone wanting a sizable medal: you won’t get one. 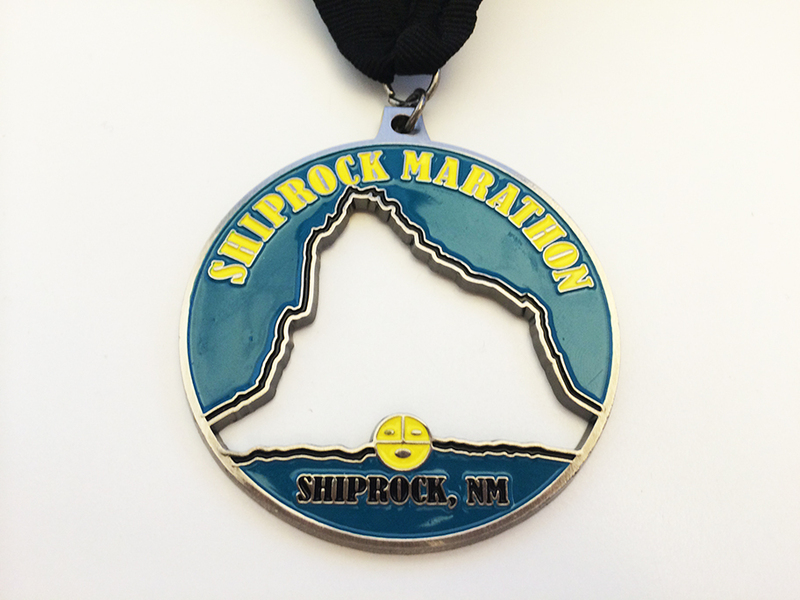 2014 Shiprock Marathon – I tend to lower my expectations for small races such as this one, which takes place in Northwest New Mexico. So when I finished and they handed me this colorful medal, with the outline of the titular formation cut out of the middle, I was quite happy. Not only does it pay tribute to the giant towering Shiprock, but it doesn’t hide whatever medal you might have hanging behind it! 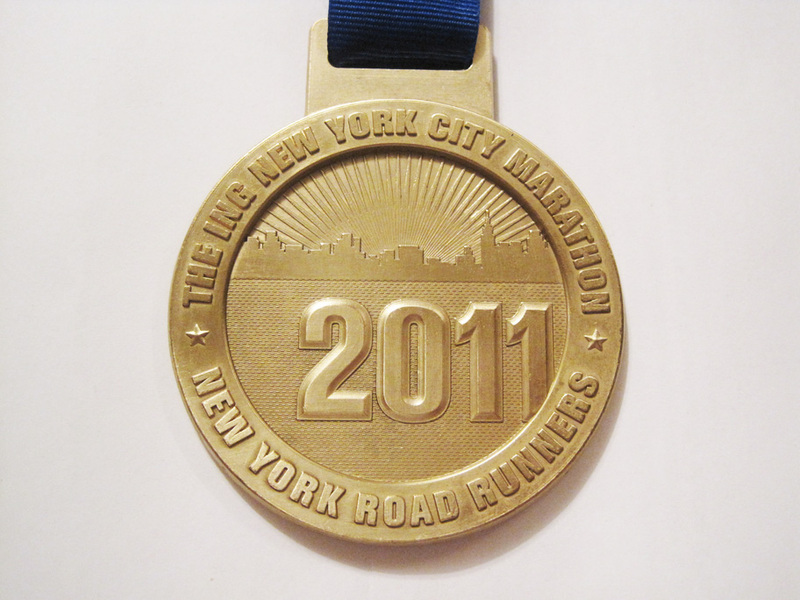 2011 ING New York City Marathon – New York Road Runners don’t need to hand out a flashy medal as an incentive to fill 47,000 slots, though they usually put together a nice, classy medal. This one is pretty austere, with the skyline barely noticeable behind the year. 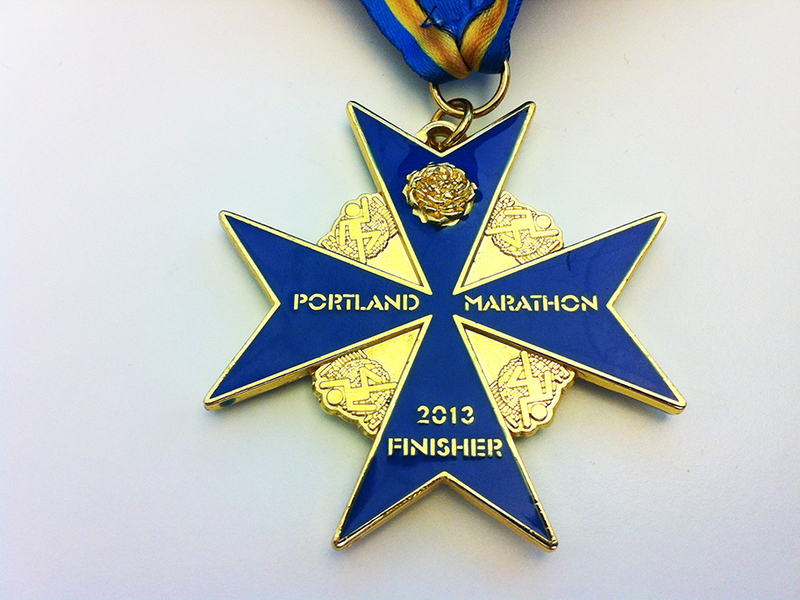 If this were any other marathon, I’d have a complaint or two, but given the prestige, I hang it proudly. 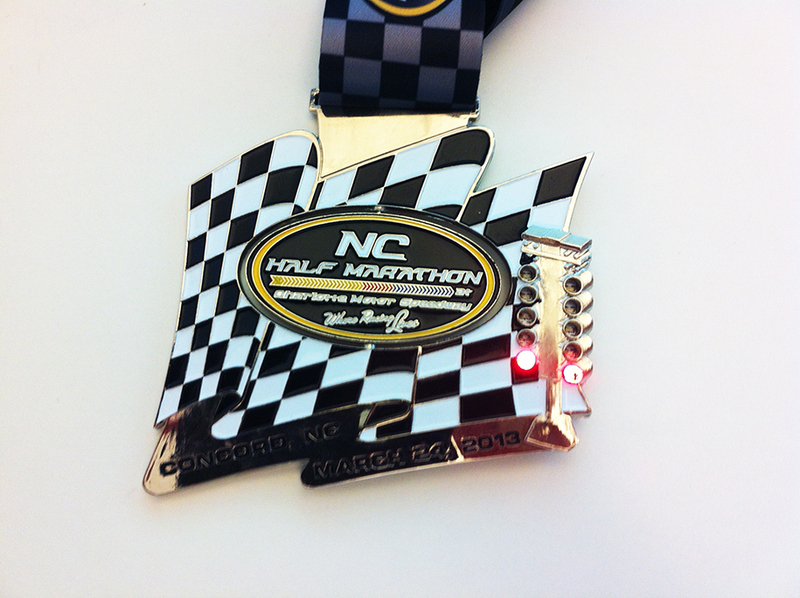 2013 NC Half Marathon – This race started in 2012 with a medal email blast. I saw it and came extremely close to signing up just to earn the racetrack-themed medal with moving parts and LED lights. This year the organizers did away with the moving cars and changed the race backdrop to a waving checkered flag but keeping the flashing lights. The middle is a spinning component, but both sides are the same. 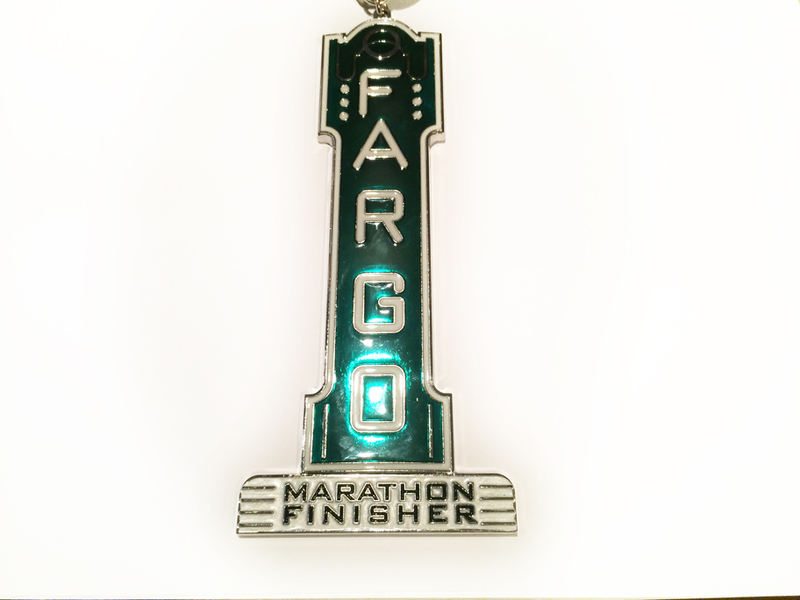 2015 Fargo Marathon – This is a race that typically gives out very wacky, colorful and gaudy medals. 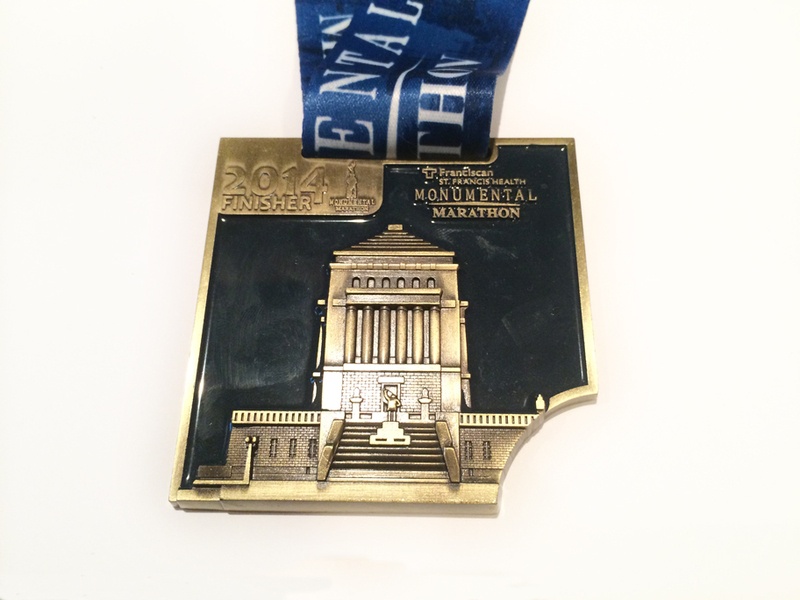 For 2015, they decided to fashion a medal out of a local landmark. Runners pass the art-deco theater sign about two miles from the finish, which means fatigue will probably prevent you from seeing it. 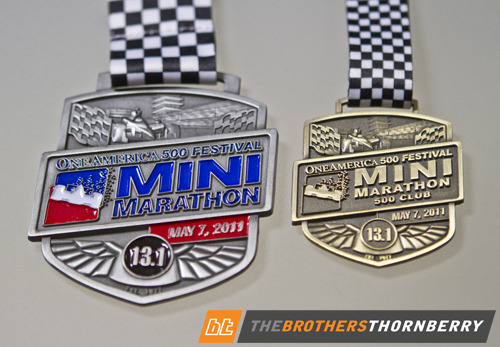 The half marathoners receive the same medal in a smaller version. 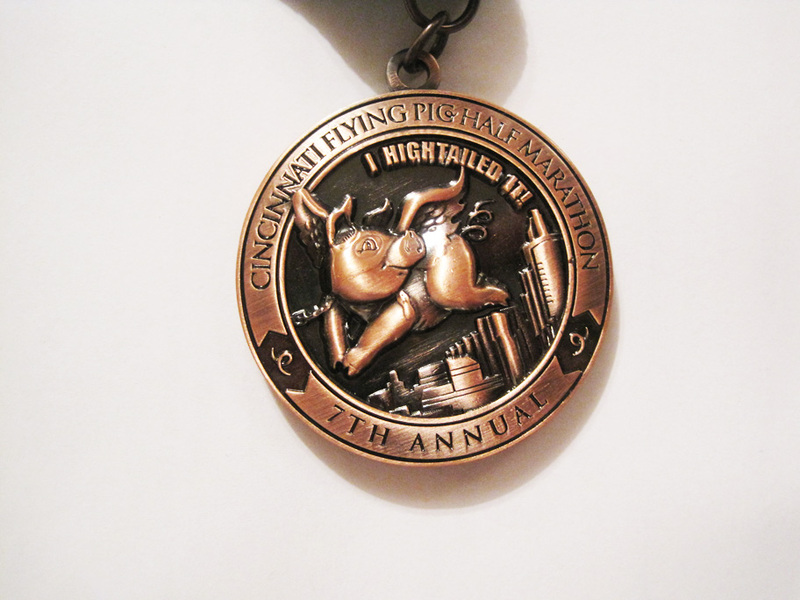 2011 Cincinnati Flying Pig Half Marathon – This is a perfect example of a medal that gets people out to a race. It changes very little from year to year, often in the form of an accessory such as pilot goggles, or in the catchphrase. But you can always count on a detailed flying pig and its haunches on the back. 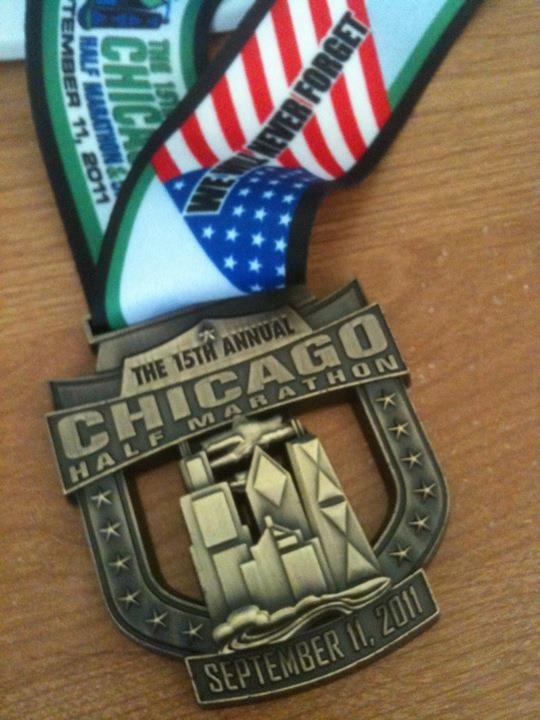 I’m actually considering running the full marathon just as an excuse to get another one of these. 2014 Air Force Marathon – Nothing says raw power like a fighter jet. 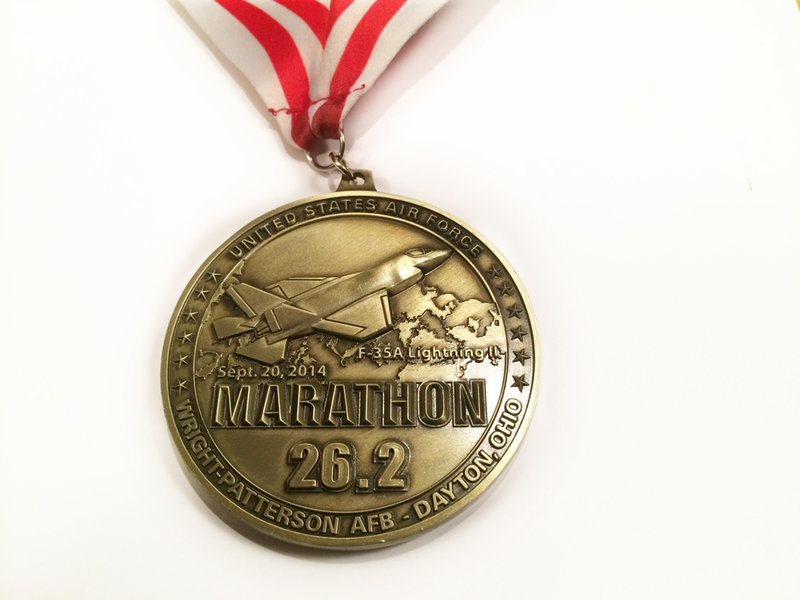 Every year, the Air Force Marathon features a different military plane on its medal and promotional materials, and every year the medal is a crowd favorite. Each distance (from the 5k to the marathon) features the same plane, but the medals are bigger according to distance. 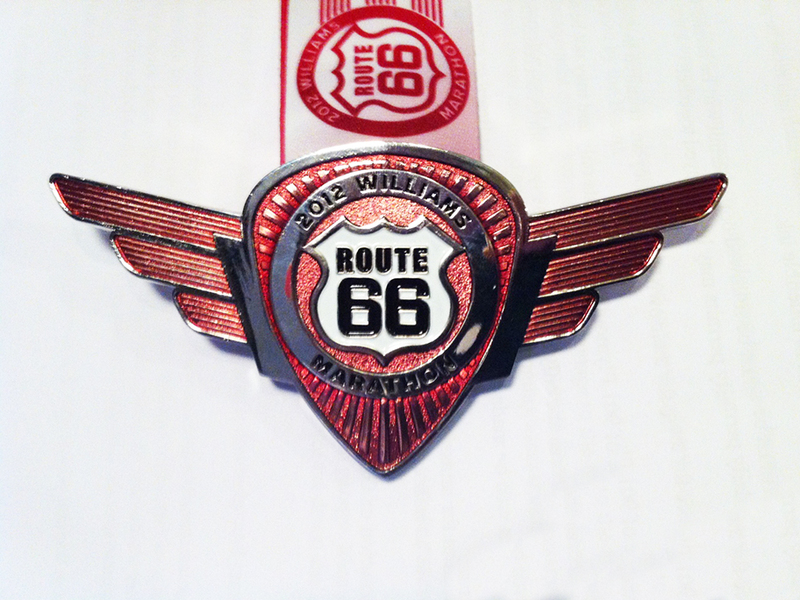 2012 Williams Route 66 Marathon – This is a race that, like the Tupelo Marathon, has developed a following for two reasons: lots of 50-staters use it to knock out Oklahoma off their list and it gives all finishers a gorgeous medal. It changes every year, but is always inspired by vintage American automobiles and has made 26point2medals.com‘s top 3 for the last three years. This year’s is an homage to the 1936 Dodge pickup truck and it looks fantastic. Very colorful and with an equally bright ribbon, it will definitely stand out in anyone’s medal rack. appropriate comparison. It does have a touch of royalty on both sides, making it for an instant eye-catcher in anyone’s medal rack. While it is a bit small, the detail pops out once you take a close look. The organizers also heavily emphasized their commitment to aiding and paying tribute to the 2013 Boston Marathon, which is likely why they added blue and yellow. 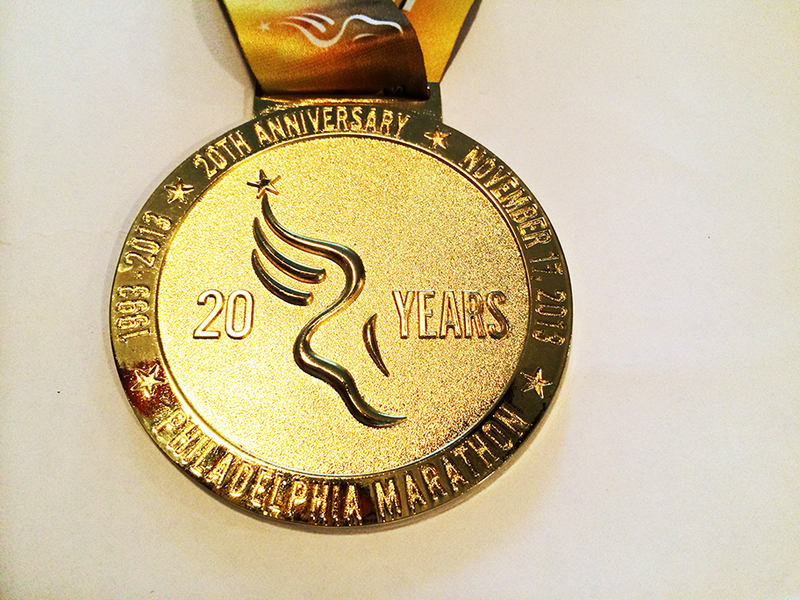 2013 Philadelphia Marathon – What this medal lacks in original design or color, it makes up for it in size. Though not the biggest medal out there, it’s much larger than it looks. It also sports the Liberty Bell on the back with an embossed square should racers decide to engrave their official finishing time. I wasn’t too thrilled with this classic look, as previous years have added some color to the design. 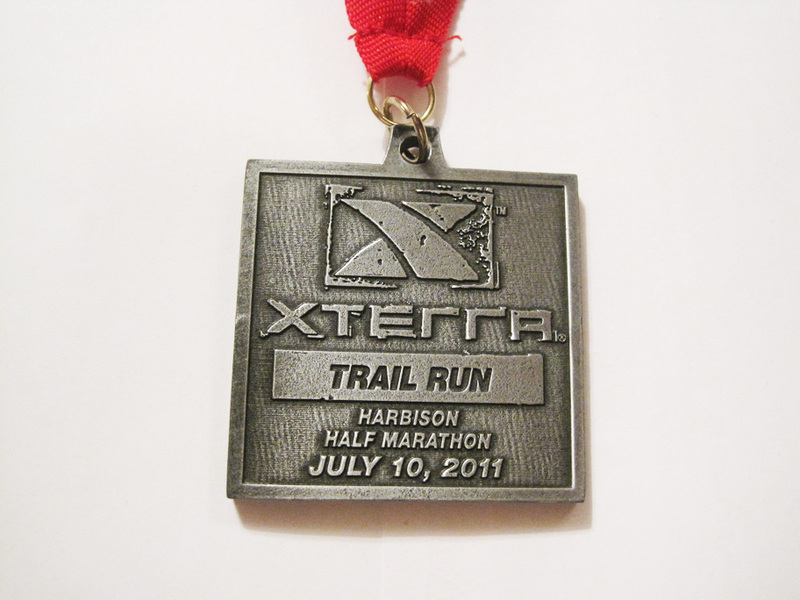 2011 XTERRA Trail Run – I was too dehydrated and exhausted to look at this medal. Sure, it’s pretty generic and doesn’t give you much aside from the XTERRA logo. But then again, it fits the race’s threadbare organization and course. 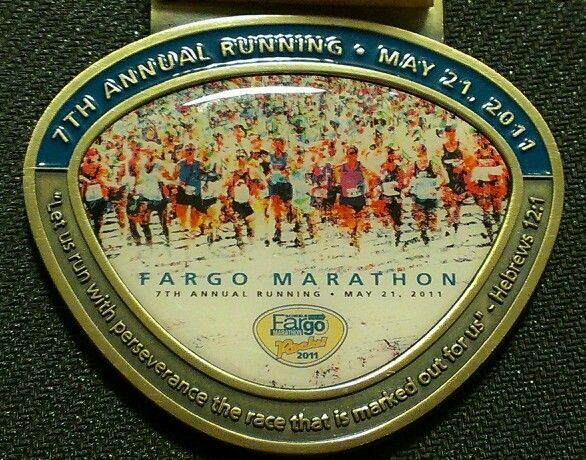 I wouldn’t expect a shiny, colorful medallion for such a brutal, savage race. 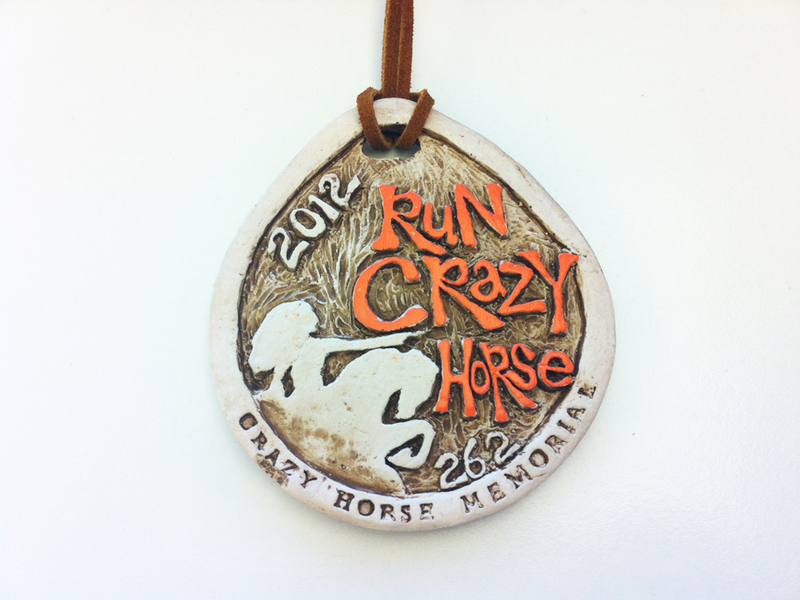 2012 Run Crazy Horse Marathon – This is one of several races that makes their finishers medallions out of clay. I’m not entirely sure if they are individually handmade or if they’ve managed to churn them out in a more mechanical, efficient way. Regardless, it’s a beautiful medal and shows the Crazy Horse Memorial as it will look in a few decades once it’s finished. The leather strap and brightly colored race title also help in making this an awesome trophy. 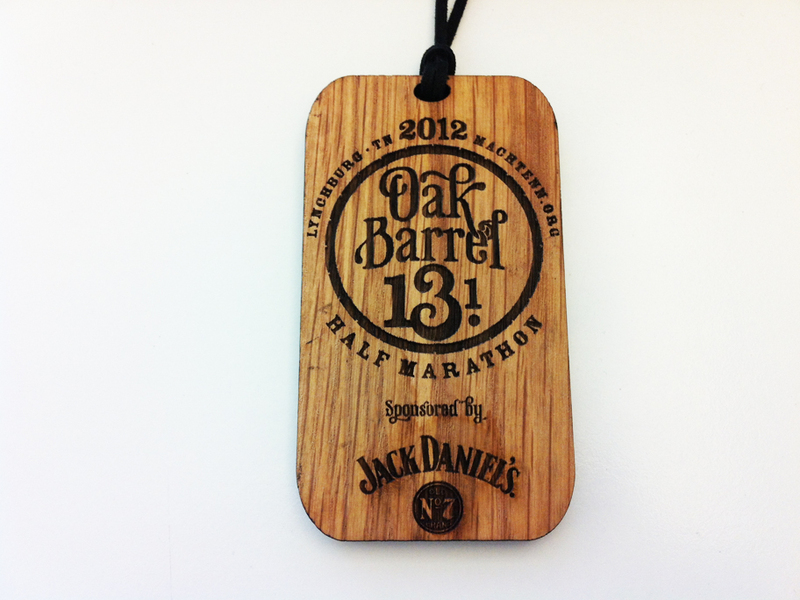 2012 Oak Barrel Half Marathon – I picked this race for the medal. Each finisher receives this elegant, wooden prize, which displays the race logo in incredible detail. 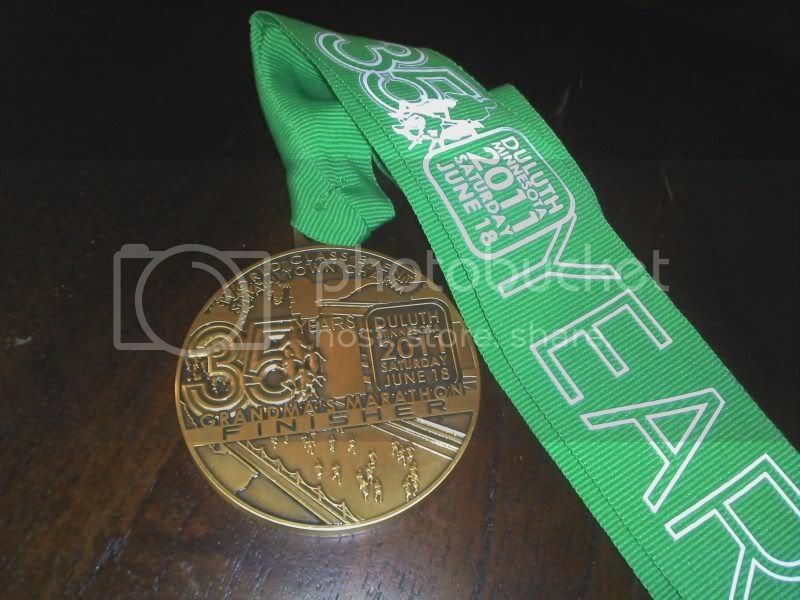 The medal changes every year, but retains the same basic design and charm. It’s one of my favorite medals so far. 2011 LIVESTRONG Austin Half Marathon – This is another one of my favorites. 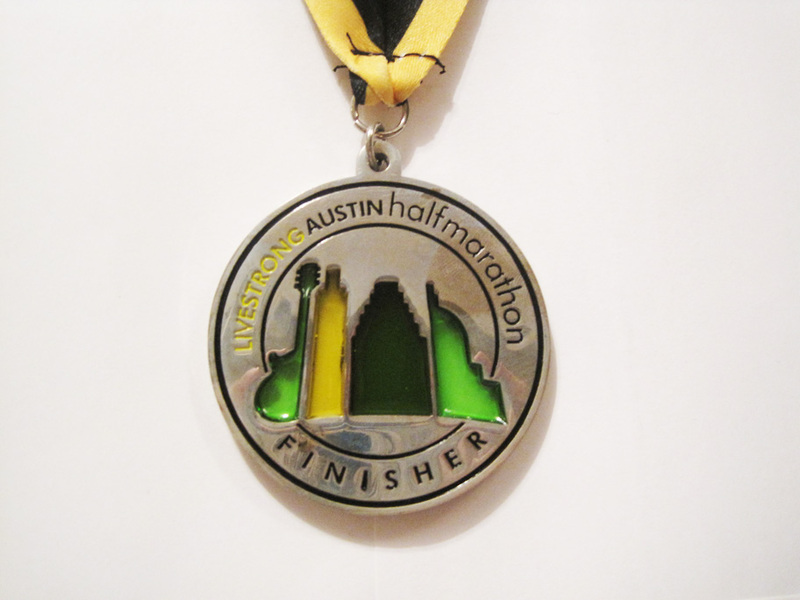 Each section of the stylized Austin skyline is stained glass, matching the color palette of its titular sponsor, LIVESTRONG. It’s elegant, classy, and the black/yellow ribbon is a delightful bonus. 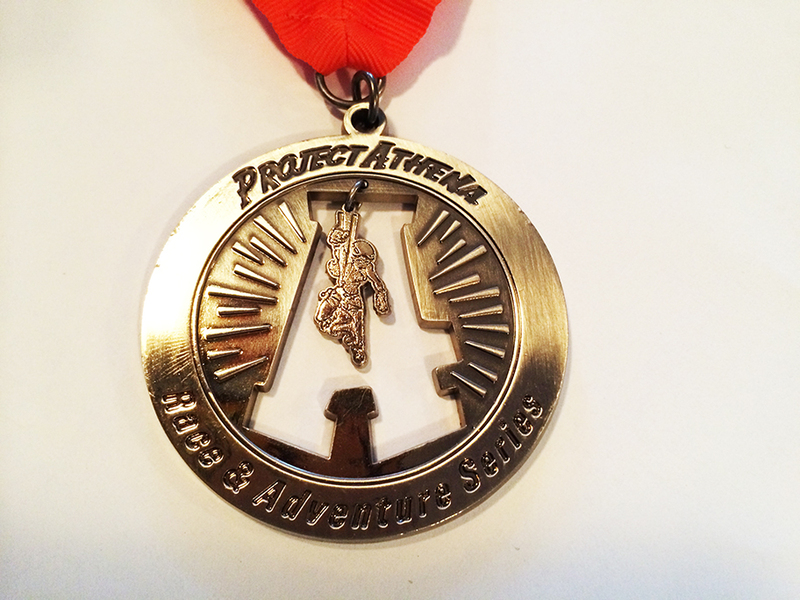 2013 Moab Trail Half Marathon – Finishers of this otherwordly adventure race receive a generic Project Athena Race & Adventure Series medal, regardless of the distance completed. This is the kind of medal that disappoints me because it has absolutely none of the race components in it. No beautiful arches, sandstone cliffs, no date, no year, not even the name of the race itself. Though the race was amazing, I wish they would siphon money from somewhere else (offer cotton t-shirts, perhaps not offer every finisher a coffee mug) and add some zazz to their medal instead. 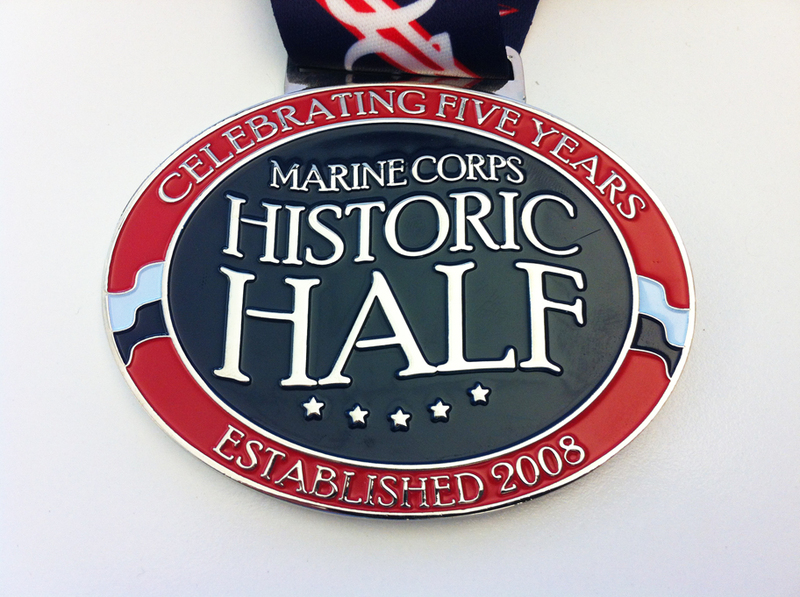 2012 Marine Corps Historic Half Marathon – This medal is large, colorful and has a different design on both sides. The ribbon is equally patriotic and colorful, which is perfect given the race’s theme and organization. While it doesn’t have the same epic quality as its bigger brother, the Marine Corps marathon, its a great addition to the collection. 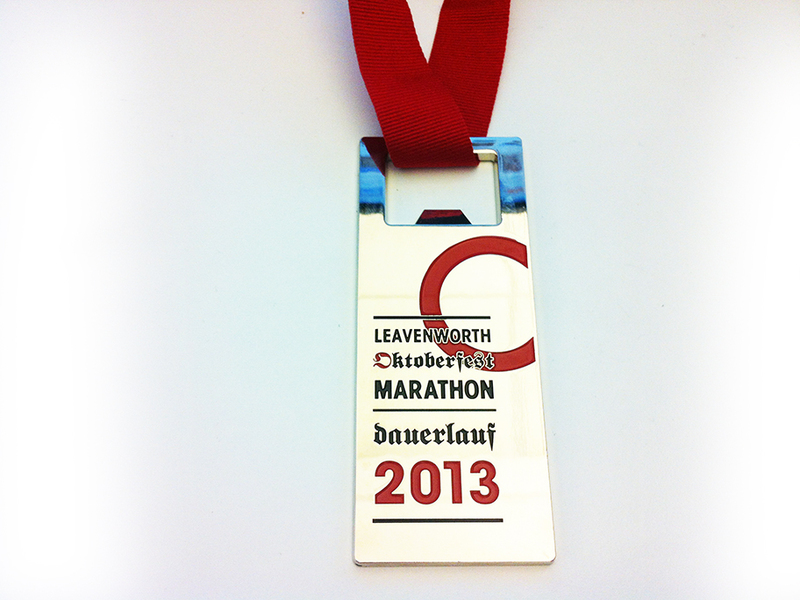 2013 Leavenworth Oktoberfest Marathon – Finding a previous version of this medal proved difficult, so I had no expectations of what to receive. Plus, given how remote the race was, the course’s scenic beauty was enough of a payoff. But this elegant bottle-opener was a big surprise. Heavy and very tastefully designed, it’s definitely worth the trek into the mountains of central Washington. 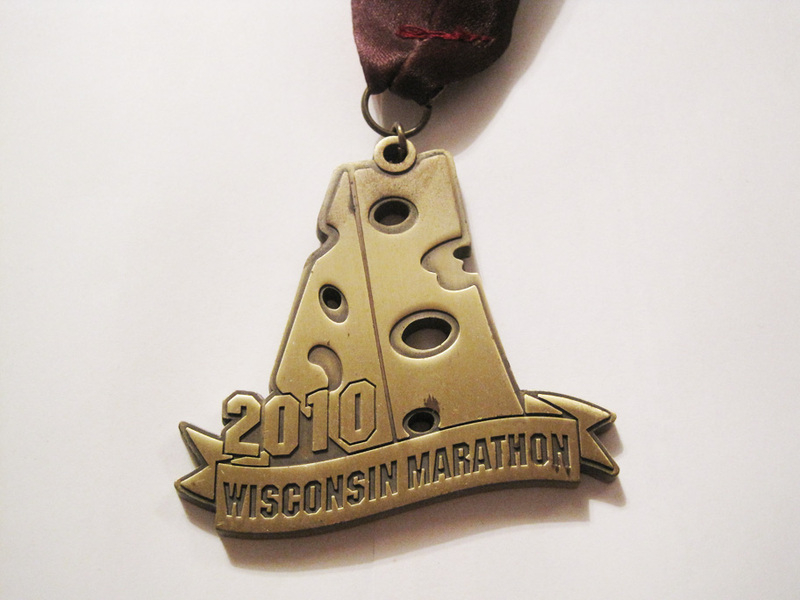 2010 Wisconsin Half Marathon – It was the 2009 medal for this race that made me realize that not all finisher’s prizes were simple medallions, but instead could be quirky or funny. Wanting a slice of that Wisconsin cheese, I signed up and earned this bad boy. As far as I’ve seen, the medal always has cheese on it, with the design changing only slightly from year to year. However, the medals for the half and full marathon are the same (both say “Wisconsin Marathon”), which can annoy some runners. 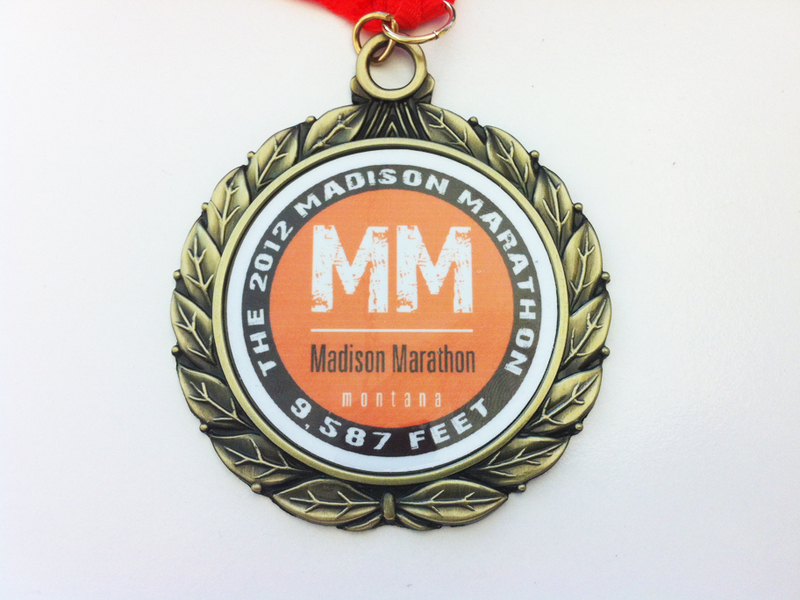 2010 Madison Mini-Marathon – The year before was the race’s inaugural year and it sported a nice, standard medal. 2010 improved on that design by incorporating the Wisconsin State Capitol and making it larger. I approve. 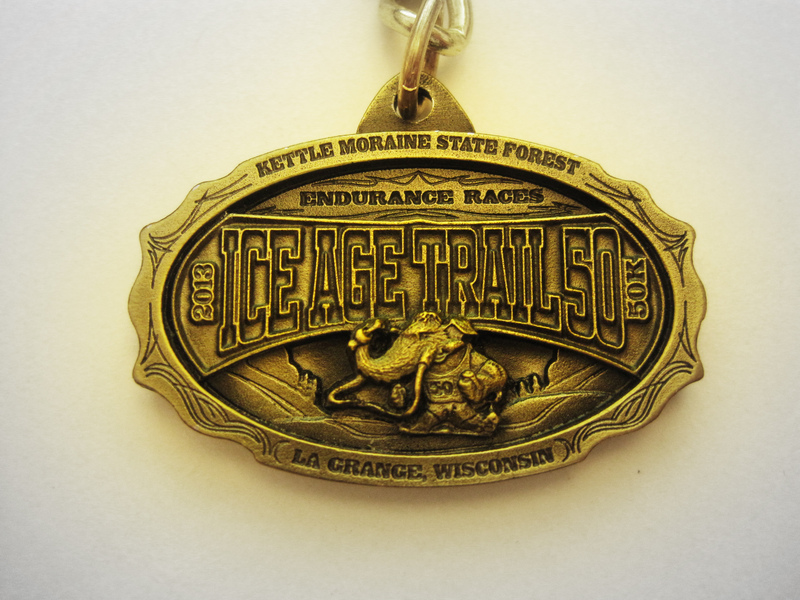 2013 Ice Age Trail 50k – I was a bit blindsided by this trinket. After finishing my first ever 50k in a dizzying fit of exhaustion, I paid little heed to this when it was handed to me. It wasn’t until a few minutes later that I realized nobody had given me a medal. Instead, I had this tiny, albeit impressively detailed keychain which was the size of those pennies that they flatten at museums as souvenirs. I won’t complain because it has already grown on me (har). But still, they should tell you beforehand so you can manage your expectations. Wow! This is awesome! I’ve considered starting a 50 state half marathon goal since I will have 3 states under my belt by January but you’ve run a few that are on my list of “must dos” like Chicago, New York, Austin, and Disneyland. Good luck with upcoming races! 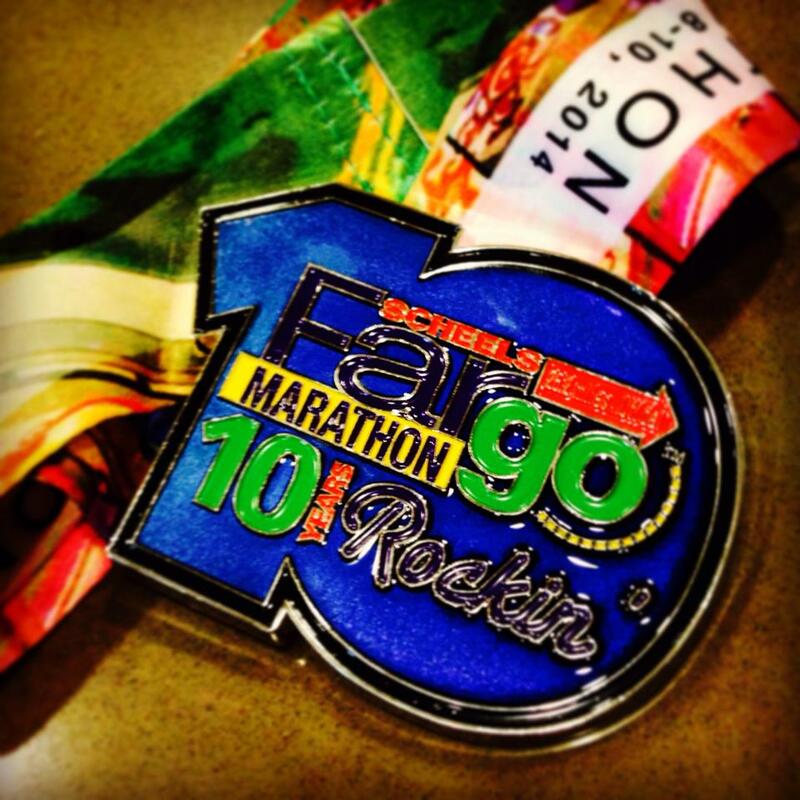 I love seeing all the medals from your races! I might have to steal this idea (though I have far fewer medals). What an accomplishment! Looks like you are well on your way to your 50 states goal! Great collection! I keep thinking about doing something like this. It’s fun to see what all of the medals from different races look like. Some are unique and some just aren’t. I have a 50 state plan also, it may take me 50 years at my current pace! Congrats on The Disney World Marathon. I just did the Half there for state number four. I am taking on the run in Eugene in April. It ends at the U of Oregon track stadium. Might be something for you to try to knock that state out in the future. Nice bling! I’m on the 50 states quest also, but I just ran my first marathon a year and a half ago. Keep running strong! Whoa – these are absolutely awesome!!! Hard work and dedication went into obtaining these – GREAT job!